When you need a little extra space, our 3-5 bedroom cabins in Gatlinburg and Pigeon Forge are a great fit. With space for family and friends, sleeping 6 to 20+ guests, they offer room to play, eat, and relax. They're loaded with favorites like fully equipped kitchens, game rooms, movie theaters, private indoor pools, living rooms with big screen TVs, and spacious decks - all designed to bring you together! Browse below or call us at 1.800.684.7865 to let a Vacation Planner find the right cabin for YOU! Charming and cozy, A Dream to Night boasts fun amenities and comfortable spaces, giving YOU a home in the mountains. This 3-bedroom, 2.5-bathroom cabin harbors activities for kids and adults, amenities for movie night in the cabin, and the conveniences you love having at home. Spend days soaking in the sunken hot tub, sipping coffee on the deck, and more! 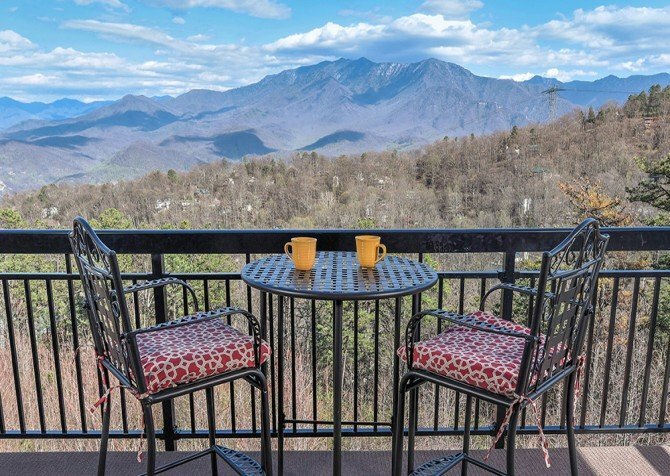 Plan your next family reunion or large group getaway to Paradise Peak, where you’ll enjoy sweeping views of Mount LeConte from 3 deck levels. This spacious cabin with 4,000 square feet of space has a classy, modern appeal with plenty of entertaining options. Take advantage of the community pool access, outdoor hot tub, rocking chair porch, updated kitchen, and so much more at Paradise Peak. Located in Sherwood Forest in Pigeon Forge, Splish Splash features 5 bedrooms, 5 1/2 bathrooms, and over 4,000 square feet of space for family and friends to spread out. Stay entertained with air hockey, pool table, a big screen TV, and a Blu-ray player. Then relax with mountain views from the deck, an outdoor hot tub, and access to the community pool. It's great for any group getaway. 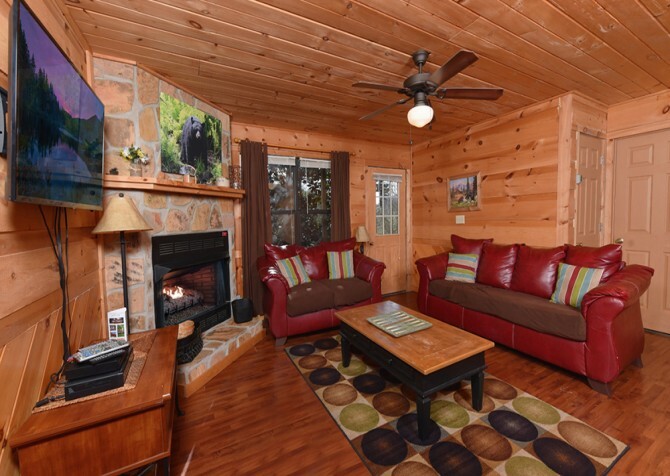 Big enough for a large family or group, Big Bear Plunge is fully equipped with 3 bedrooms, 3 bathrooms, and loads of fun! 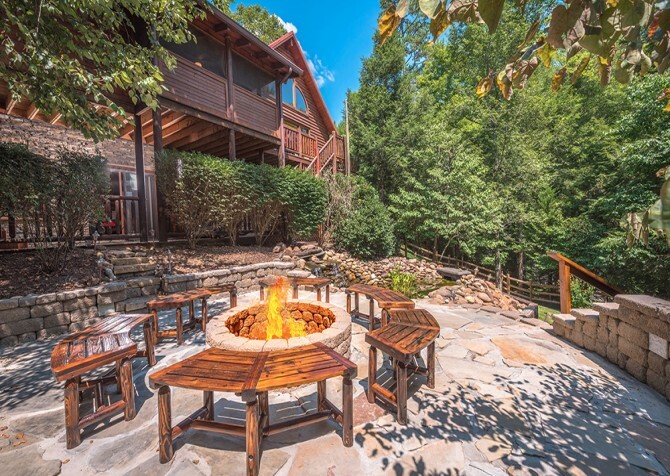 A private, indoor pool and an in-cabin theater room are only a couple of the exciting amenities you'll find at this gorgeous Smoky Mountain property. Best of all, you're only minutes away from the entertainment hub of the Smokies: Pigeon Forge! For a modern mountain cabin that offers impressive views without sacrificing entertainment, check out A Splashtastic View. 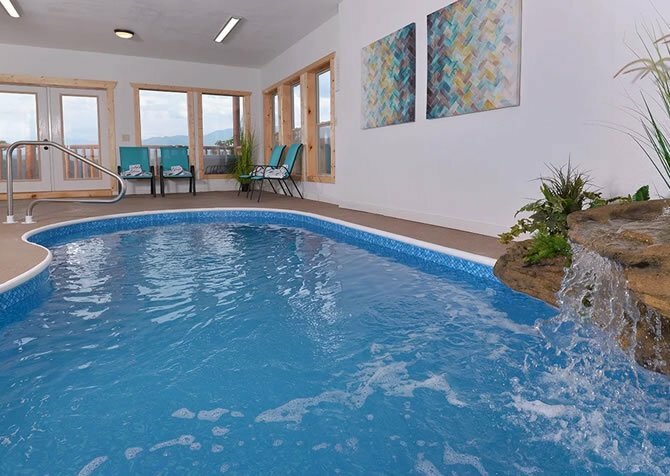 This comfortable Pigeon Forge retreat is loaded with fun, including a rec room, indoor pool, outdoor hot tub, fire pit, and more for your group to enjoy during your stay. Or you can head into town to explore, shop, and eat! Kids and adults will love this fun getaway! Get inspired by the calming wooded views, soothe tired muscles in the outdoor hot tub, play pool and arcade games all night, read novels by the electric (heated) fireplace, sway in the decks’ rocking chairs, relax in the indoor jetted tub, and snuggle in a king-size bed at this 4-bedroom, 3.5-bathroom cabin for 12 in Pigeon Forge, TN. 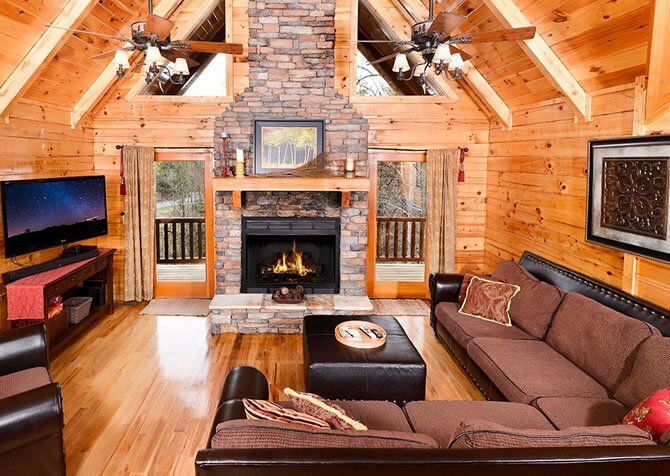 With 4 gas fireplaces, 3 bedrooms, 3 bathrooms, multiple rec spaces, a fully equipped kitchen, and a covered back deck, A Suite Escape for 8 in Pigeon Forge is the perfect place for couples’ retreats, getaways with friends, or family vacations. Unwind with a good book by the fire, take spa baths in the jetted tubs, play pool and air hockey, and more! Minutes from the entrance to the Great Smoky Mountains National Park, Absolute Heaven boasts a great location for outdoor enthusiasts. Four master suites offer peaceful retreats within this 4-bedroom beauty, awesome amenities are found throughout, and amazing views are waiting from almost every space! It's perfectly suited for couples' retreats, weekends with friends, and more! Take advantage of the Sherwood Forest outdoor community pool on warm afternoons and cuddle in front of a warm fire in the gorgeous stacked-stone fireplace on crisp mountain evenings. 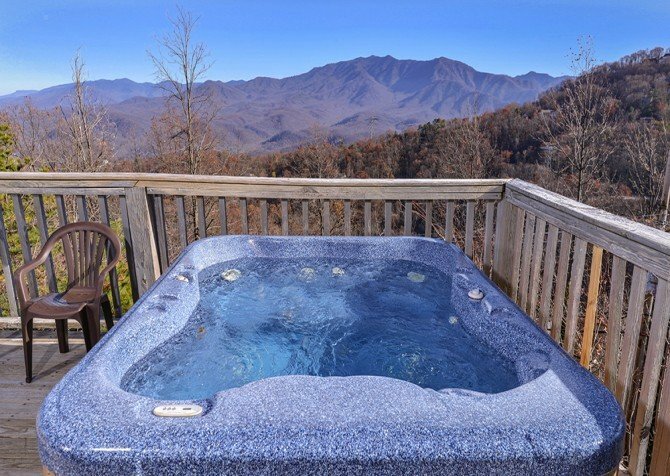 Return from trips to downtown Pigeon Forge, under 3 miles away, to relax in the outdoor hot tub or settle into a rocking chair on the deck to soak in beautiful views of the Smokies. 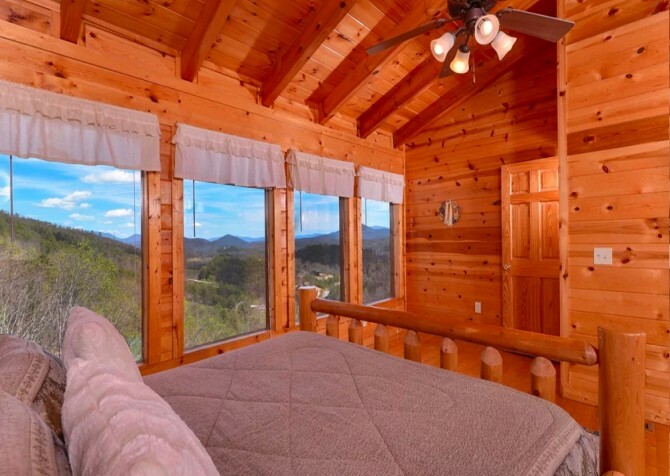 Boasting beautiful mountain views, a rec room of dreams, multiple spacious decks, an outdoor hot tub, and 4 bedrooms — each with their own flatscreen TV, king-size bed, and en-suite bathroom — this Smoky Mountain cabin sleeps up to 12 guests comfortably. Perfect for large family trips, couples’ retreats, and group getaways, It’s a Wonderful Life awaits! 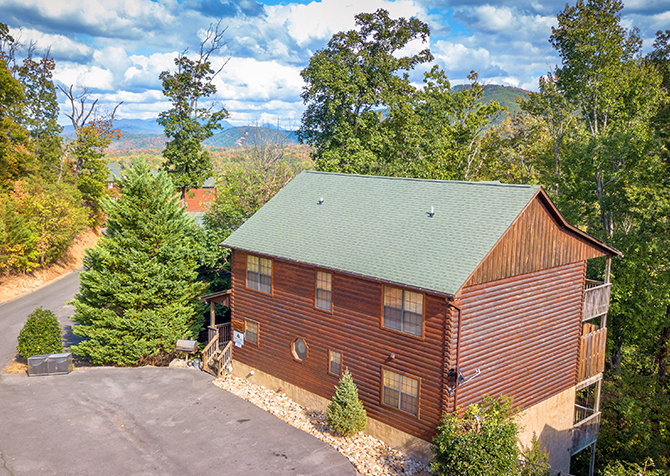 This 2-bedroom + loft cabin has room for 16 guests to make your Pigeon Forge retreat great for small group getaways. The rec room boasts a pool table and foosball table, and the bedrooms are spacious and comfortable for quiet nights after exploring downtown. 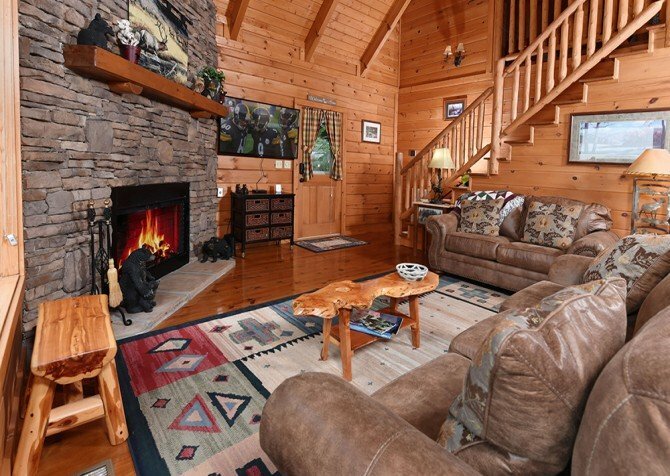 Take in mountain views or relax in the comfortable living room of this beautiful cabin in the Great Smoky Mountains! 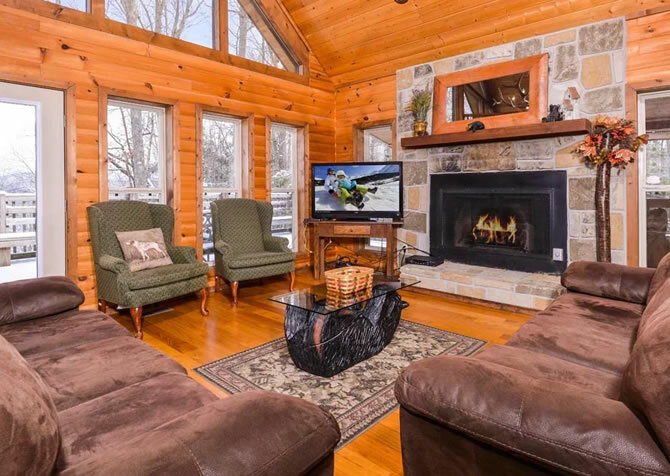 This fun 3-bedroom cabin perfectly mixes relaxation with entertainment, offering TVs in the bedrooms, a master suite with a fireplace by the jetted tub, pool and arcade games, and a deck with a fireplace and hot tub! What can your large group look forward to at Keaton’s Kottage? How about an indoor private pool, 2 outdoor hot tubs, and a private home theater? And there’s more! This modern mountain retreat also provides arcade games, 3 deck levels, and access to a community outdoor pool in the summer months. Your friends, family, and 4-legged pals are sure to enjoy your stay at Keaton’s Kottage. Filled with Smoky Mountain décor and a range of indoor and outdoor amenities, Awesome Getaway and a Theater is a great choice for family get-togethers and small group retreats. You’ll be able to comfortably accommodate 12 guests inside this 4-bedroom cabin, and besides easy access to downtown, Awesome Getaway and a Theater provides a variety of options for fun without ever leaving the driveway! A Sweet Retreat’s list of amenities goes on and on, with Netflix and a Blu-ray player, wireless internet, a wood-burning fireplace, a fully equipped kitchen, an outdoor fire pit with seating, 2 jetted tubs inside, game tables, and so much more! You won't even have to leave the cabin to have a fun vacation when you stay here, but you're not far from the fun of downtown when you do want to get out! A great place with plenty of space, this 3-level, 4-bathroom, 5-bedroom cabin has more than enough amenities to keep your whole family entertained. Teach the little ones to swim at the community pool, bake tasty treats in the fully equipped kitchen, play pool, have an evening soak in the outdoor hot tub, beat the highest Galaga score, and more! 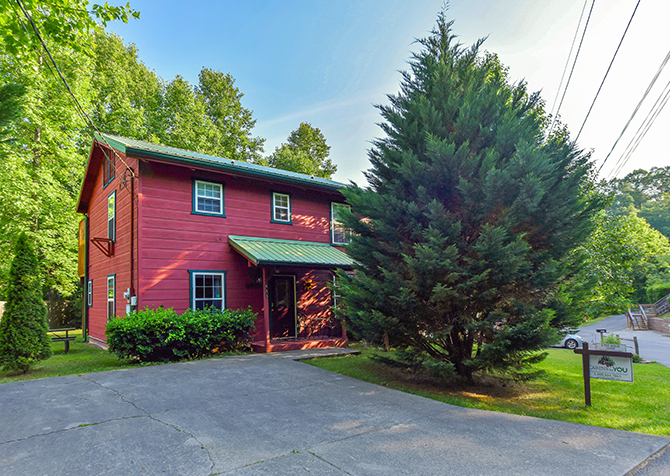 Bring family and friends for an unforgettable stay at this 3-bedroom, 2-bathroom cabin for 8 in the Great Smoky Mountains! 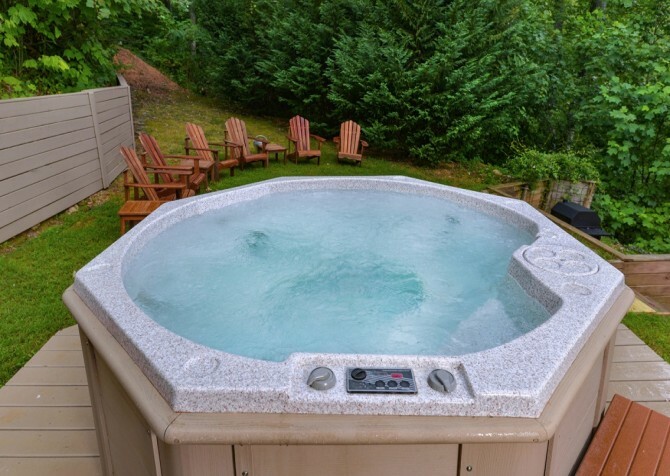 Soak tired muscles in the bubbly hot tub outdoors, read novels by the electric (heated) fireplace, whip up meals in the fully equipped kitchen, play provided board games with your group, and snuggle in a king-size bed. 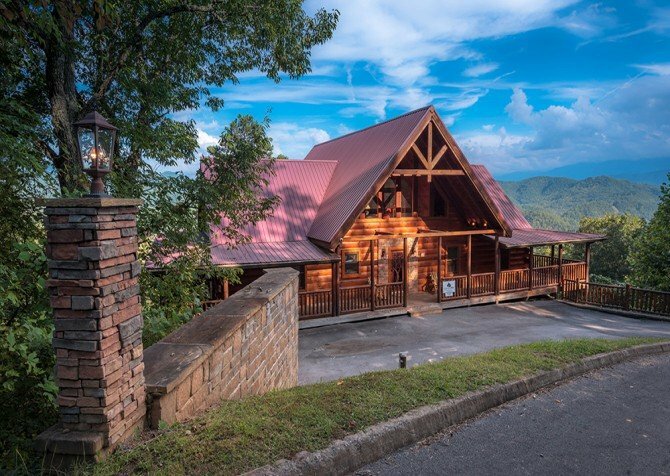 Heavenly Daze await in the Smokies at this 3-bedroom, 2.5-bathroom cabin for 8, featuring big screen TV, game tables, an outdoor hot tub, and more! Light a toasty fire in the gas fireplace for a nighttime read, sip coffee on the covered deck with breathtaking mountain views, play air hockey and foosball with friends, and snuggle in the king-size bed. 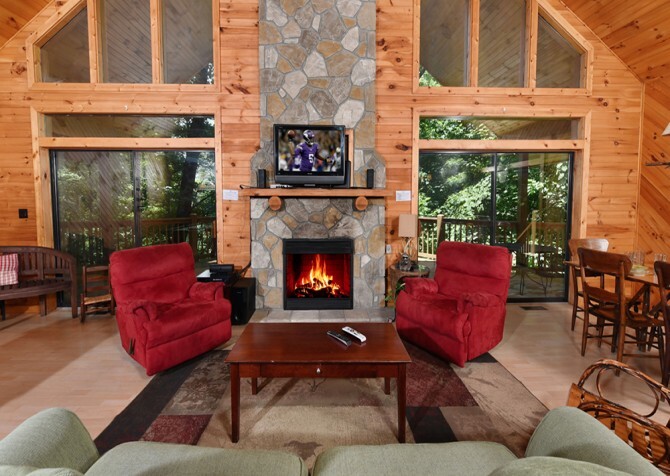 Get ready for delightful mountain-view mornings, brisk afternoon swims, fun barbecue evenings, relaxing movie-nights in, and thrilling game tournaments for days — all at this accommodating cabin in the Smokies! 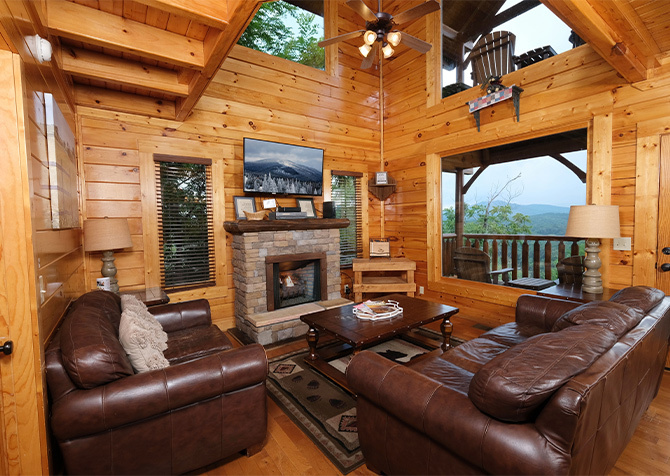 Family vacays, trips with friends, couples’ getaways…A Bear’s Eye View is a 3-bedroom, 3.5-bathroom cabin rental in the Sky Harbor community of Gatlinburg, TN, perfect for a memorable stay for 10. Play games in the rec loft, whip up meals in the fully equipped kitchen, soak tired muscles in the outdoor hot tub, enjoy tree-lined views, and relax in king-size beds. 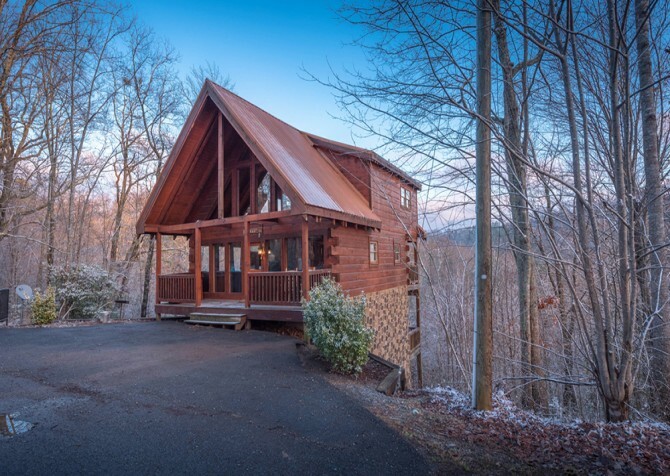 The secluded location of this 4-bedroom Pigeon Forge cabin encourages you to have a peaceful vacation in the Smoky Mountains. Sleeping 8 guests, this cabin rental features a large kitchen for in-cabin meals, a comfortable living area where you can relax, 6 flatscreen TVs, and much more. Play arcade games or pool on a laid-back day after spending some time eating, shopping, and exploring downtown. With 3 bedrooms, 3 bathrooms and tons of amenities, your group will fall in love with the dreamy afternoon light of the sunroom, the warm bubbles of the hot tub, and picturesque gazebo in the backyard. After returning from nearby Gatlinburg, under 6 miles away, convene around the dinner table for a meal with good friends and family. Get ready to feel what it’s like to live among the trees — in comfort — at Treetop Tranquility in Pigeon Forge. 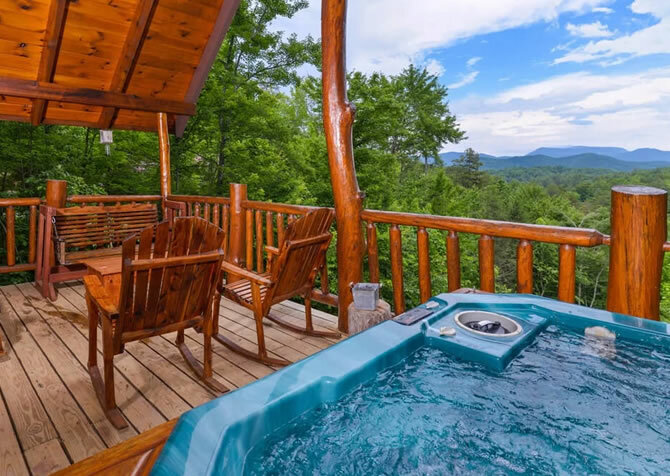 With 3 king-size beds, a TV in every bedroom, an outdoor hot tub, a shower with a stone entryway, a pool table, a variety of family-friendly board games, a wet bar, and a fully equipped kitchen, Treetop Tranquility will add a touch of charm to your Smoky Mountain vacation. 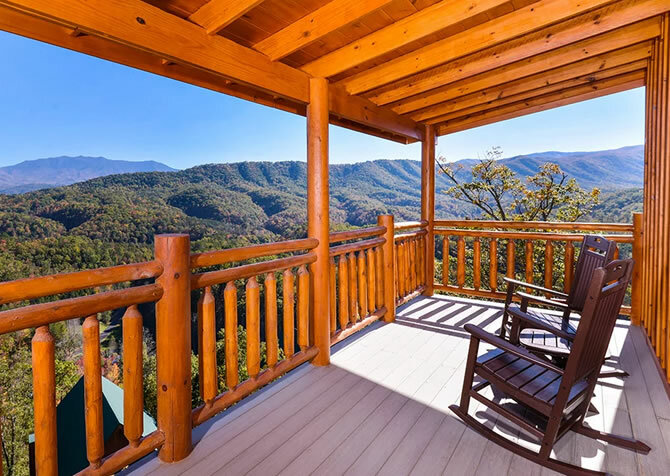 A mountain and valley view is framed by the large covered porch at this Pigeon Forge cabin rental. Three bedrooms offer gas fireplaces, while one also boasts a bedside jetted tub for a refreshing morning soak. 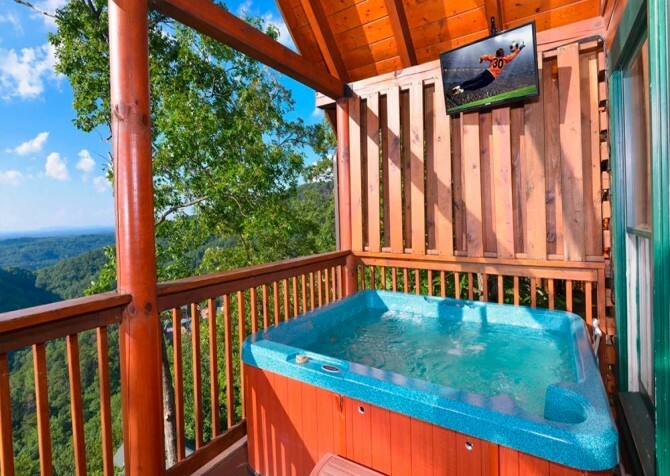 Soak in the hot tub or flip on the flatscreen TV after a busy day playing and exploring in the Great Smoky Mountains. A large tree fireplace and a private indoor pool set this 3-bedroom property apart. Charming mountain decor, including tree bark trim and log furnishings, is paired with comfortable bedding and wooded and valley views. 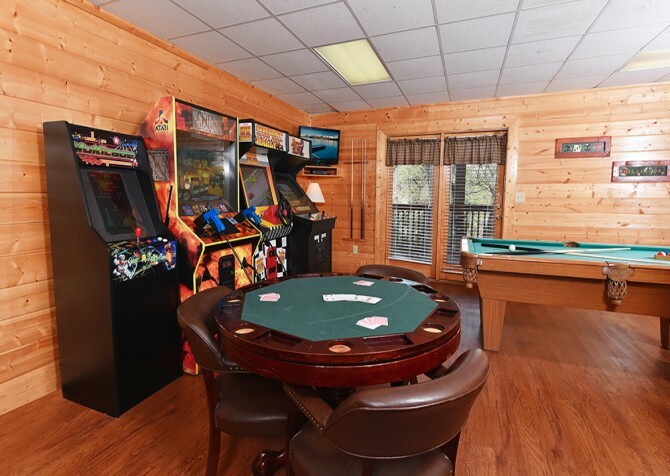 Everyone will stay entertained in the cabin with tons of games – from pool and foosball to Xbox and darts – and everyone can relax in the outdoor hot tub at the end of the day. At approximately 1,600 square feet, Around the Bend provides plenty of space for up to 10 guests. This 3-bedroom, 2-bathroom cabin offers a fully equipped kitchen, a large wall-mounted smart TV plus game table in the living room, and tranquil outdoor spaces. 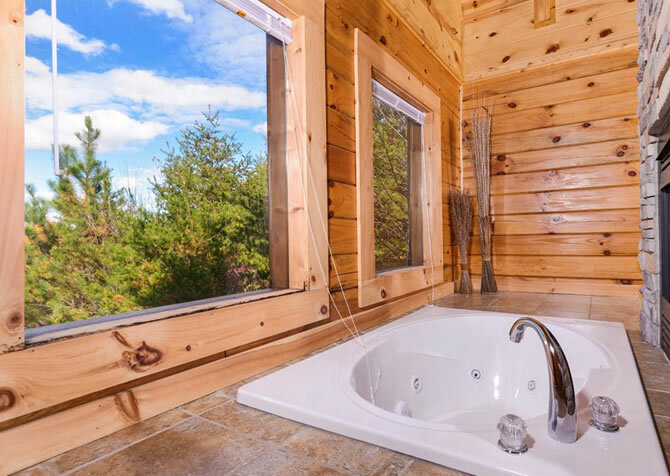 Soak away your stresses in the steamy hot tub and relax in the rocking chairs with wooded views on the back deck. With breathtaking mountain views from all 3 floors, Point of Grace makes your vacation memorable. Witness the light and shadows dance over the mountain range, unwind with your favorite novel by a crackling fire, see your child’s face light up as you splash around together in the private indoor pool, and end every evening with a movie night in the theater room. Sleeping up to 20 guests, Views Above the Rest provides 5 bedrooms and 5 bathrooms to keep everyone comfy and cozy. Plus, with a 50-inch flatscreen TV in every bedroom, multiple games in the rec room, and 3 spacious decks — complete with rocking chairs and incredible views — entertaining your large group will be easy at this 3,500 square-foot home! Applewood Manor is ideal for small group vacations and family getaways with its spacious interior and entertaining extras. 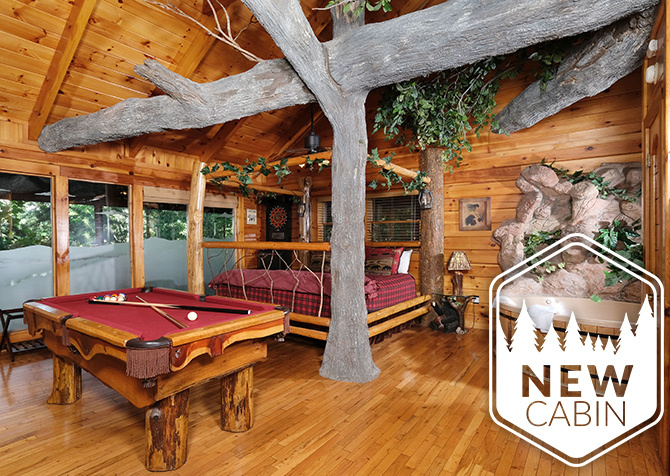 Along with a gorgeous indoor pool, this cabin offers a relaxing indoor hot tub, game tables, multiple rocking chair porches, and large living spaces. You’ll also be less than 3 miles from group attractions on the Parkway in Pigeon Forge! This 5-bedroom, 5-bathroom pet-friendly cabin provides enough space to accommodate 11 guests plus the 4-legged ones! 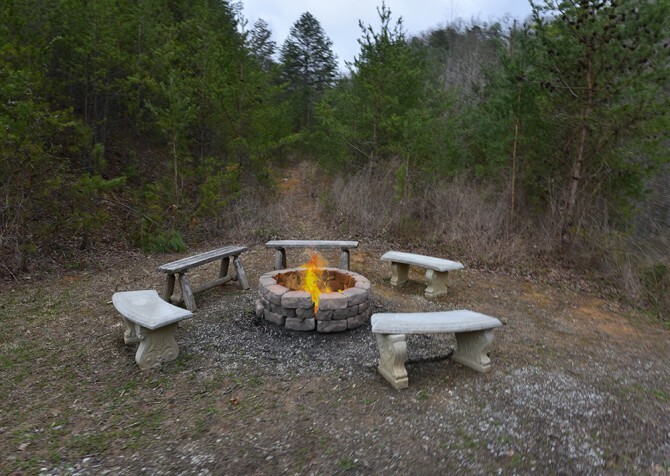 Gather around the fire pit outside while the kids play with the dog near the porch swing at the edge of the woods. After long, fun-filled days, let your furry friend rest at the foot of your cushy recliner in front of the fire. Featuring a steamy hot tub, a fun pool table, an entertaining firepit, multiple living spaces, 3 cozy bedrooms with a mix of king and queen-size beds, 3 bonus sleeper sofas, a great location less than 6 miles from Pigeon Forge, and tranquil wooded views, Keaton’s Wild Animal Cabin is the perfect cabin for your getaway of 14 to the Great Smoky Mountains! Featuring magnificent mountain views and accommodations for up to 8 guests, Smoky View Straight Up is great for family trips or getaways with friends. With 3 bedrooms, 2 bathrooms, a rec room, and an outdoor hot tub, this cabin provides comfort and entertainment in one. Beat the highest arcade score, play pool with your pals, and snuggle up in the king-size bed! 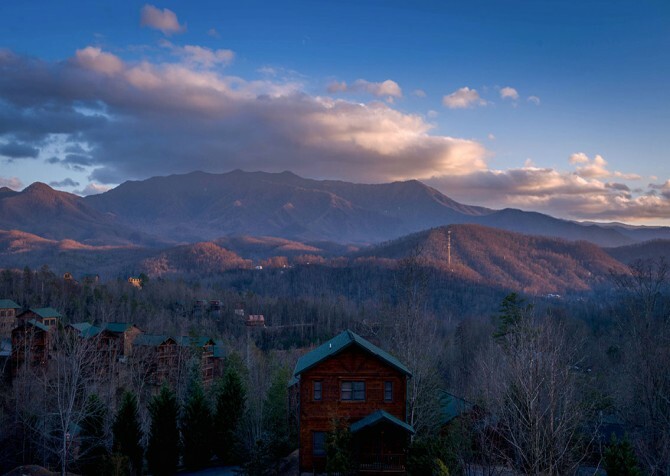 Not far from downtown Gatlinburg, Unforgettable offers the best of both worlds — Smoky Mountain serenity and city fun. 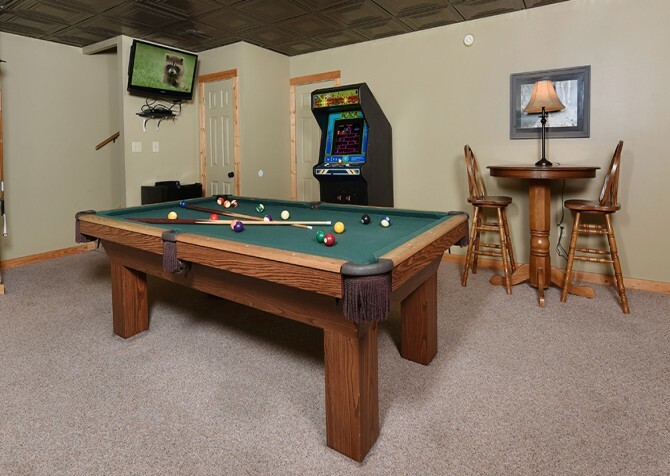 The rec room features a big screen TV, a pool table, and an arcade console, and the living area boasts a stone fireplace and comfortable furnishings. 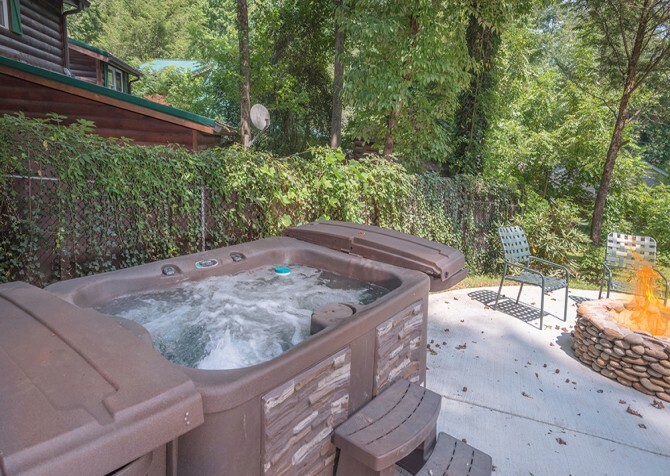 Relax in the hot tub outside, read a romance novel by a warm fire, or make homemade meals in the fully equipped kitchen. Along with 3 bedrooms, Endless Views and a Theater provides 2 queen sleepers and plenty of kitchen, dining, and hangout space for your small group. to feel comfortable and relaxed. 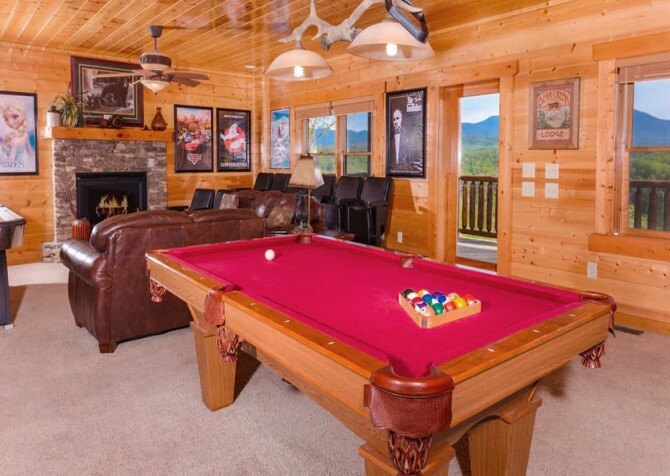 Have fun in your loaded game room or watch a movie in your private theater while enjoying your stay at this Gatlinburg cabin. And the fun of downtown is only 2 miles away! 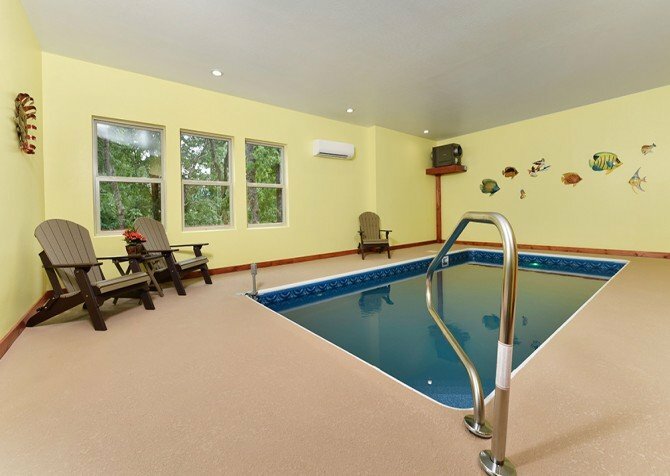 Located in Chalet Village, Gigi’s Getaway offers community pool access in summer. 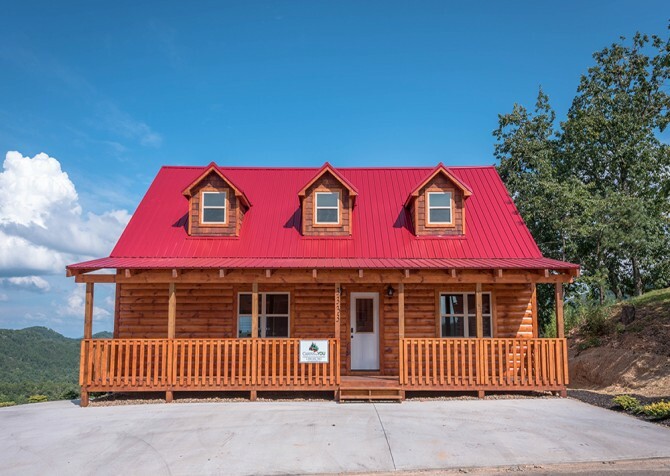 Plus, this 3-bedroom, 3 1/2-bathroom, pet-friendly cabin for up to 14 guests features a fully equipped kitchen, an open concept living and game area, an outdoor hot tub, washer and dryer, free Wi-Fi, and a mix of king, queen, and bunk beds — including a private master suite upstairs! 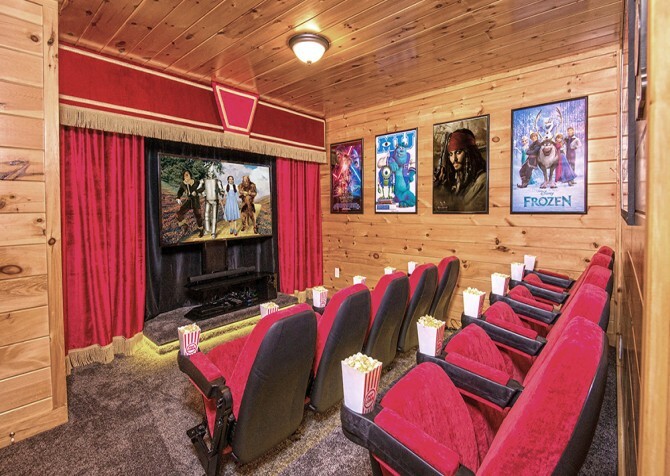 While the inside of It’s Good N Da Woods Lodge has its perks—including a fully loaded rec room that doubles as a theater room—the outside has its own special charm. 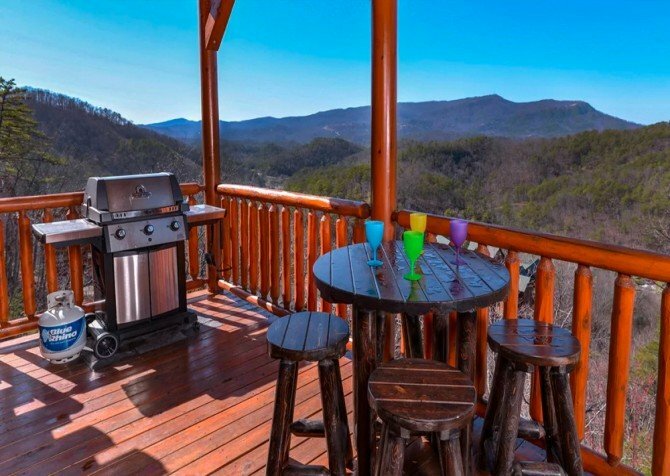 Enjoy wooded Smoky Mountain views, an outdoor fire pit, an outdoor hot tub, and multiple decks with a variety of seating options at this large-group cabin less than 6 miles from downtown Pigeon Forge. With space for 14, Angel Haven is great for family vacations and small group getaways. 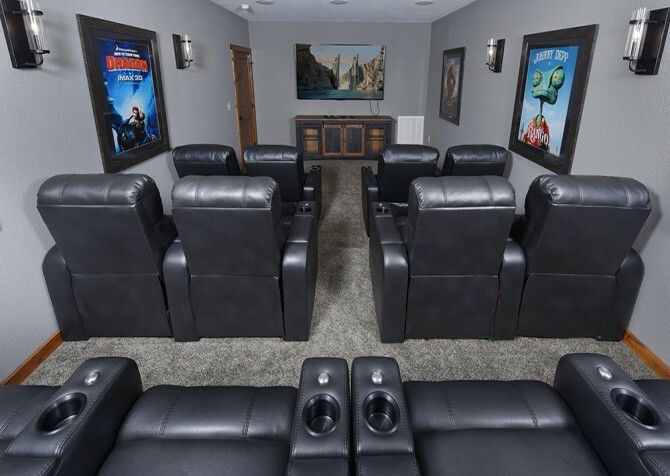 You can make meals in your full kitchen; soak in the hot tub overlooking the mountains; play air hockey, pool, arcade games, and the 4K Xbox One S in the game room; swim in your private indoor pool; or watch movies – and make drinks with Sonic-style ice – in the awesome theater room! With room for 8, cozy accommodations, plus entertaining amenities, Alpine Air is a great Smoky Mountain escape for families and friends. Add seasonal mountain views, a rec room with an arcade unit and a pool table, an outdoor hot tub, 3 king suites, paved parking, community pool access, and free Wi-Fi, and you have an elevated cabin experience. With space to accommodate up to 11 guests, A Million Dollar View is great for a group wanting to spend quiet evenings soaking in the hot tub in the sun room, fun days playing air hockey and shooting pool by a warm fire in the rec room, and cooking delicious meals in the fully loaded kitchen! Spend time with family and friends during holiday gatherings or long-overdue reunions in the Smokies while seated around the 3 spacious living room areas, playing games and sharing drinks by the wet bar in the rec room, and relaxing in the rocking chairs and outdoor hot tub in between excursions to downtown Pigeon Forge under 3 miles away. 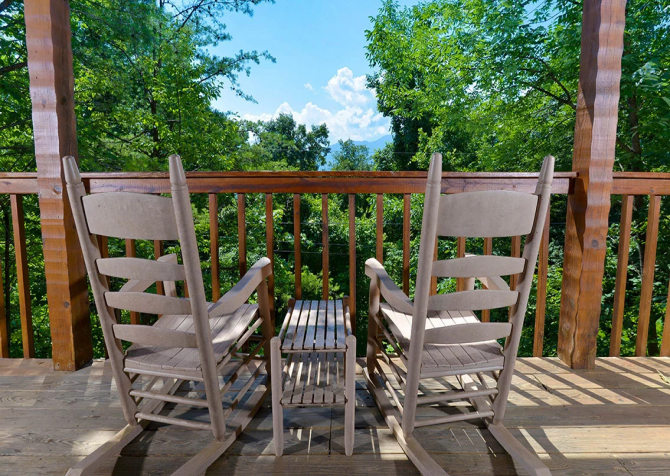 For multiple families visiting Pigeon Forge, check out The Deck House for your next stay. This 4-bedroom, 4 ½-bath cabin features a large wraparound deck with an outdoor hot tub and plenty of space to relax. Inside, you’ll have access to 2 kitchens, a large rec space, and plenty of sleeping options for up to 13 guests. 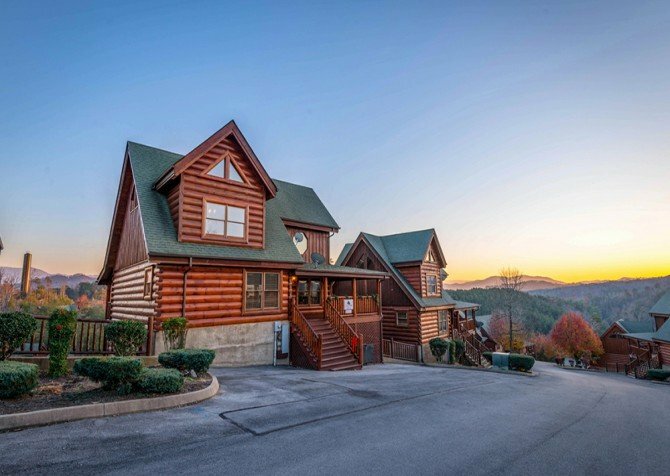 Enjoy lovely mountain and wooded views and a motorcycle-friendly driveway at Boo Boo’s Den in Pigeon Forge. This 4-bedroom cabin is a great size for small groups and multiple families. Relax and unwind in the outdoor hot tub with its own TV, play on the pool table, and plan out your days downtown with the free wireless internet. With 2 bedrooms + a loft, 2 bathrooms, and amenities aplenty, Keaton’s Cozy Cabin can accommodate up to 6 guests comfortably — entertainment and all! 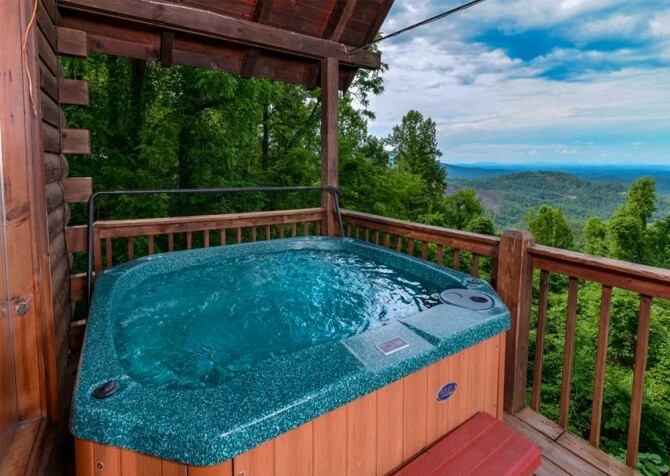 Enjoy the wooded views from the outdoor hot tub, bake cookies in the fully equipped kitchen, watch comedy classics on the big screen TV in the media room, and snuggle up on the king-size bed. 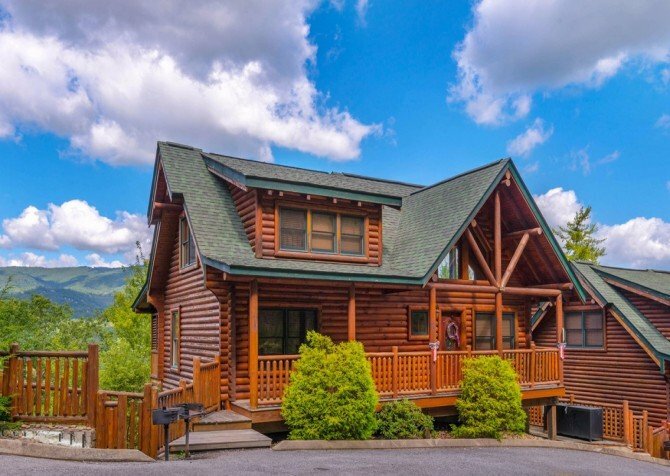 Sleeping up to 10 people, this spacious 3-level cabin in the Smokies boasts 5 king-size beds, a master bedroom with a jetted tub, arcade games in the rec room, a stone fireplace in the living room, and 2 big screen TVs! Lounge in one of the many recliners throughout the home, play some pool, and bake up a warm batch of chocolate-chip cookies in the fully equipped kitchen. 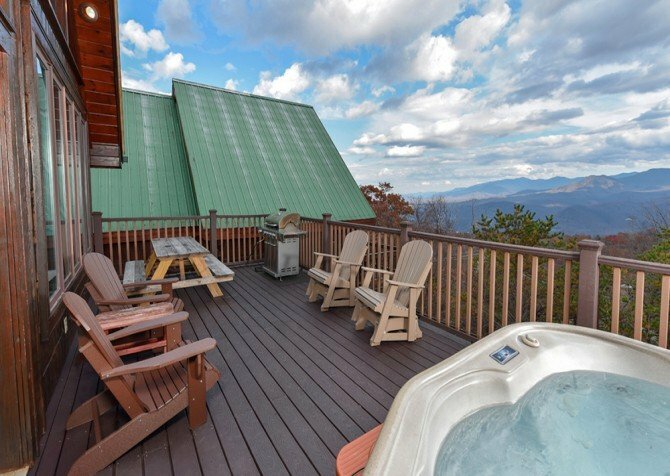 Bring family and friends (up to 12) for an unforgettable Pigeon Forge stay at Owlpine Lodge, where hot tub soaks, arcade game tournaments, wine sips by the fireplace, snoozes in king-size beds, and tranquil woodsy (and partial mountain) views await at this 3-bedroom, 4-bathroom cabin in the Great Smoky Mountains! A 3-bedroom cabin in Gatlinburg, Mountain Getaway and a Theater boasts fun for a family or group of friends. It has room for 12 guests, is pet friendly, and features high-speed Wi-Fi, an outdoor hot tub with a TV, a theater room, beautiful Smoky Mountain views, a location near downtown, arcade games, and pool, air hockey, and foosball tables. 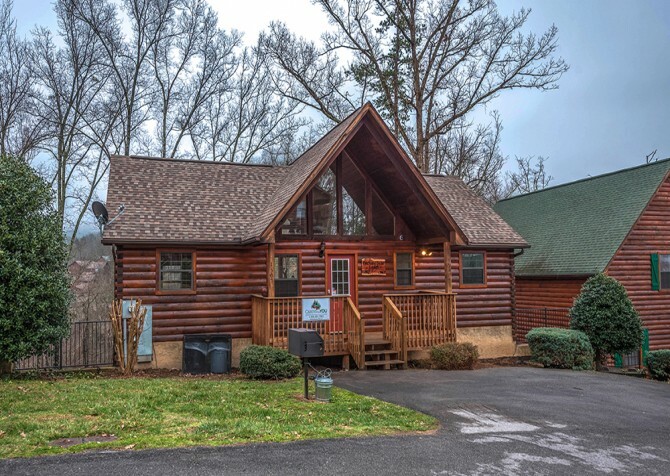 Near the attractions, restaurants, and shops of Pigeon Forge is Traveler’s Rest, a 3-bedroom cabin with comfortable accommodations for families and friends. Enjoy a full-size kitchen, a large rec room with a kitchenette, and multiple decks at this semi-private cabin. 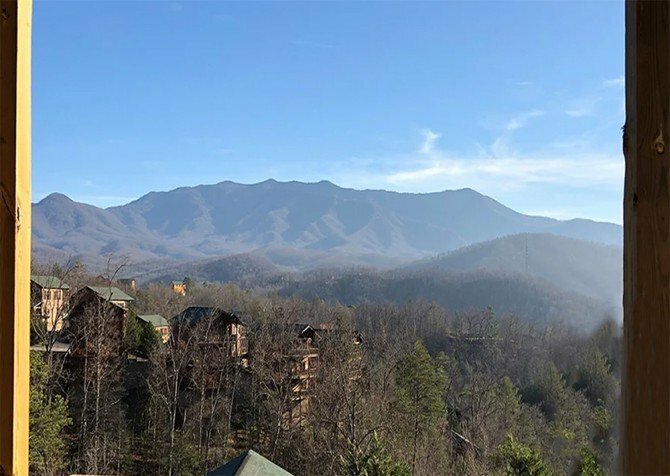 The mountain and wooded views provide the perfect Smoky Mountain atmosphere without being miles away from popular attractions. Only minutes from the hustle and bustle of downtown Gatlinburg, Morning Glory is a spacious cabin with an open floor plan ready to accommodate up to 14 guests. 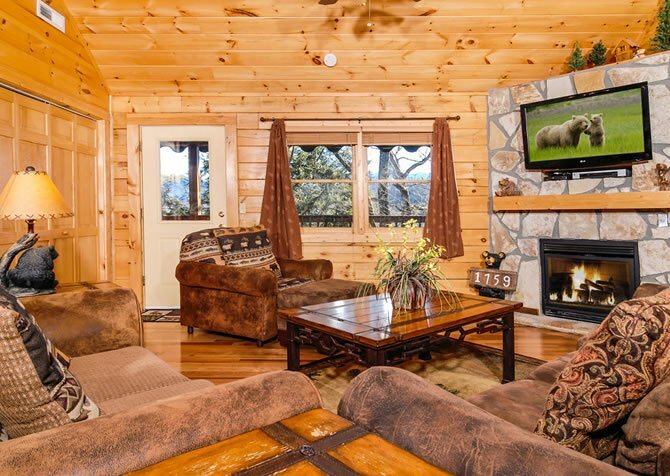 Featuring a stone gas fireplace, a pool table, a TV in every bedroom, a fully equipped kitchen, and more, this 3-level, 3-bedroom cabin with uplifting mountain views won’t disappoint. Plus, you can easily explore downtown, do some shopping, or grab a bite to eat. 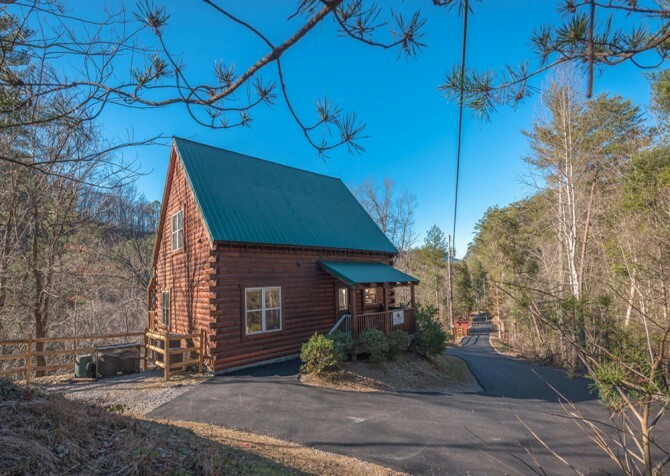 Enjoy Quiet Time with family and friends at this 3-bedroom, 2-bathroom, single-floor cabin in Gatlinburg, mere minute from the city center. Sip herbal tea on the screened-in porch, soak in woodsy views from the outdoor hot tub, play board games in the lounge, watch feature films on the big screen TV, read novels by the gas fireplace, and more! 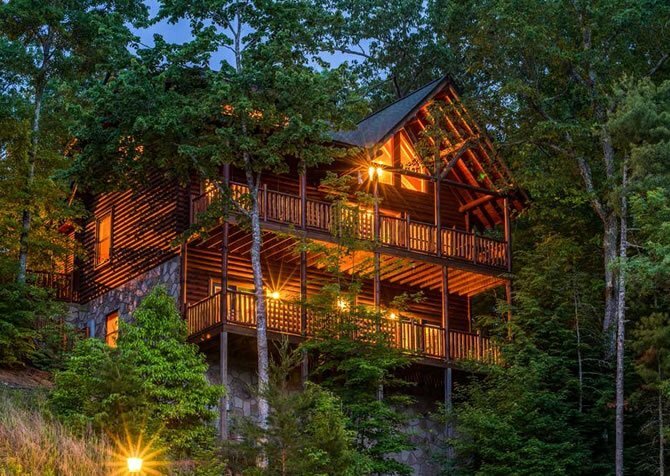 Bearadise is a relaxing retreat, perched among the trees just about 1 mile from downtown Gatlinburg. 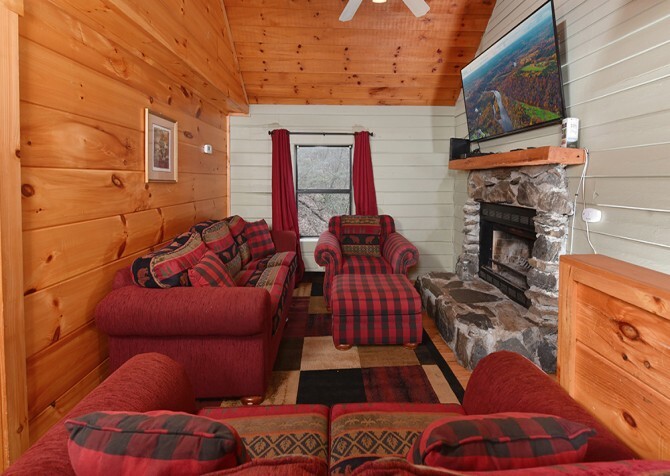 From the family room with a card table and fireplace to the outdoor fire pit area with Adirondack chairs, this 3-bedroom cabin was made for hanging out in the Smokies with family and friends. Explore downtown and then head back to Bearadise to unwind! 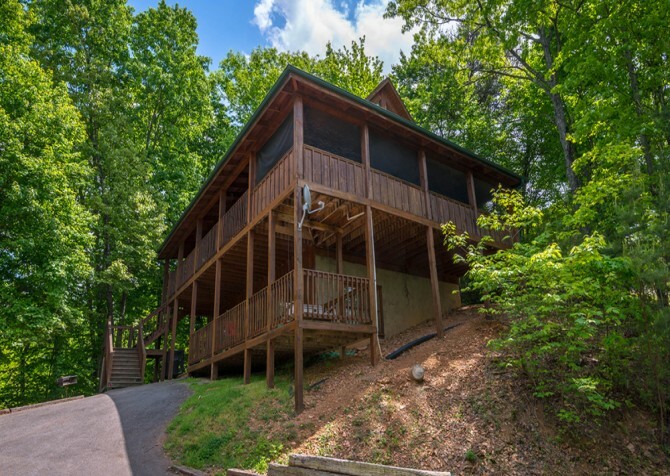 Boasting 4 bedrooms plus a loft, this Gatlinburg cabin rental is a great choice for a family reunion or vacation. Sleeping 12 guests, you will love the pool access and 3 covered decks this Smoky Mountain cabin has to offer. About 5 miles from downtown, you will have easy access to the city's best restaurants and attractions – or stay in your cabin and enjoy the full kitchen and pool table. 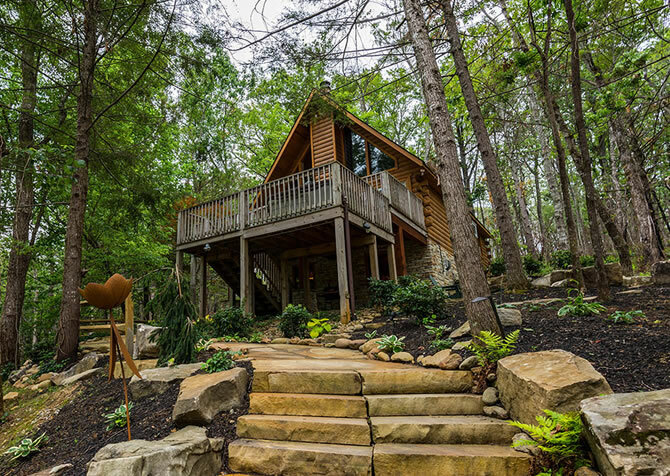 Get back to nature at Cadillac Creek, a 5-bedroom, 4-bathroom lodge for 22 in Pigeon Forge, boasting a tranquil pond with waterfall, built-in wood firepit, rocking chairs, a soothing hot tub, gas grill, and more! 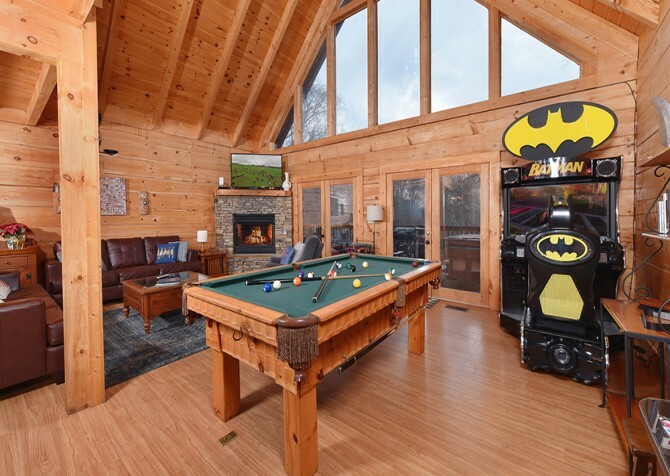 Play in the 50s-themed game room, watch feature films in the private home theater, splash at the community pool, and sleep in cozy, custom-made log beds. 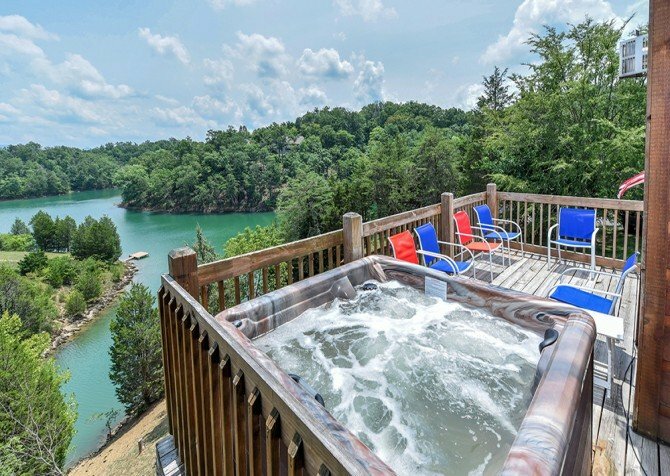 Featuring a private dock on Douglas Lake, a relaxing outdoor hot tub, a fun rec room, and a fully equipped kitchen, Lakeside Mountain Memories is a great place for family trips and getaways with friends. With a mounted flatscreen TV and a queen-size bed in all 3 bedrooms as well as a jetted tub in the master en-suite, comfort for up to 10 guests takes priority at this cabin home. If you’re bringing a small group or your family to the Smokies, check out Smoky Mountain Splash for your stay. 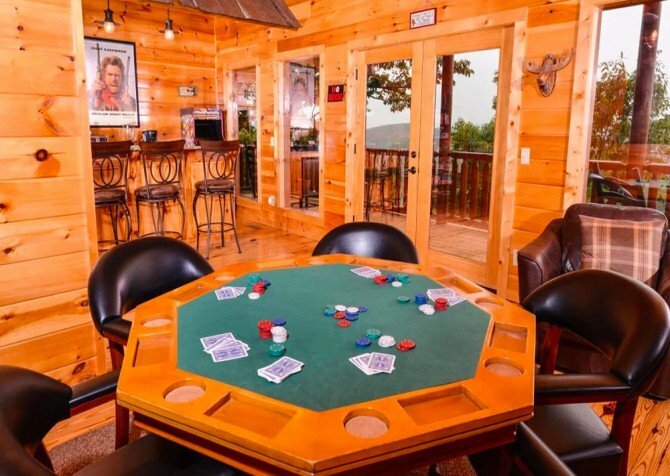 This Pigeon Forge cabin is less than 5 miles from downtown and offers game systems, a pool table, a private indoor pool, and more to keep your group entertained at the cabin. And the wooded/mountain views create the Smoky Mountain atmosphere you’re looking for in your getaway! 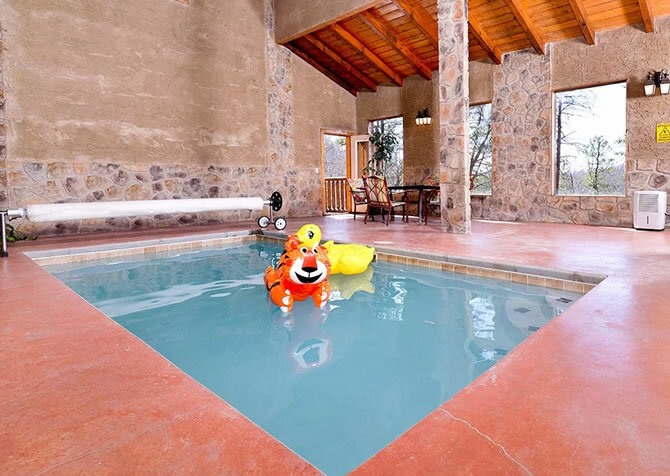 Soak in stunning mountain and wooded views from the hot tub, watch your favorite DVDs in the media space, play arcade games and bumper pool, whip up meals in the fully equipped kitchen, and snuggle in a king-size bed at Homestead Hideaway. 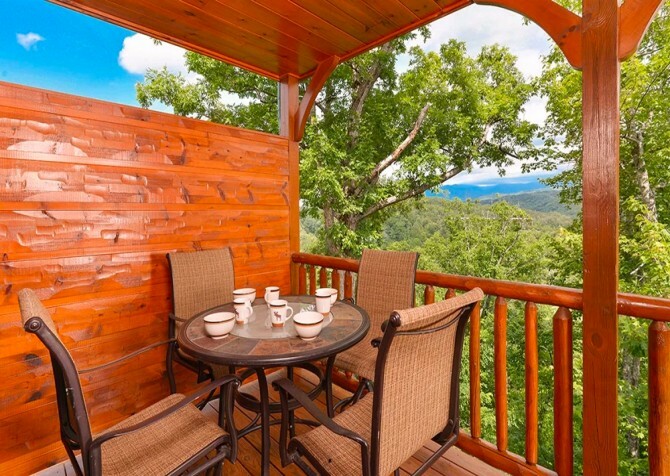 This 3-bedroom, 3-bathroom cabin rental in Pigeon Forge is perfect for couples’ retreats, family vacations, and trips with friends. 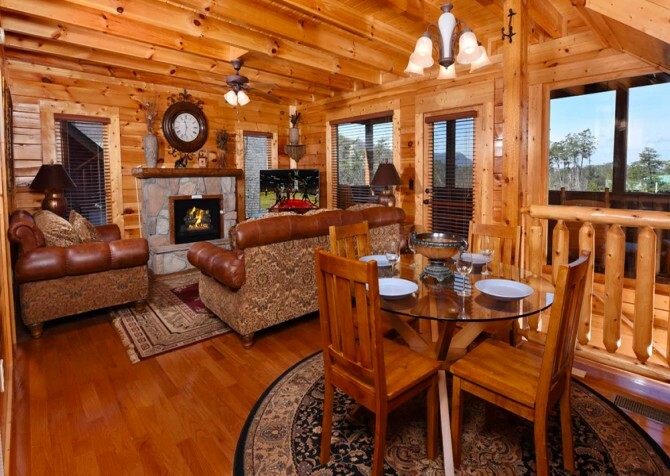 Host a special getaway for a group of 22 at Big Bear Views Lodge, a 5-bedroom, 5-bathroom, large-group cabin in Gatlinburg. Play air hockey, pool, and arcade games in the expansive rec space, pile in the home theater for a feature film, relax in the outdoor hot tub with its own flatscreen TV, and enjoy the city lights from the back deck every evening. 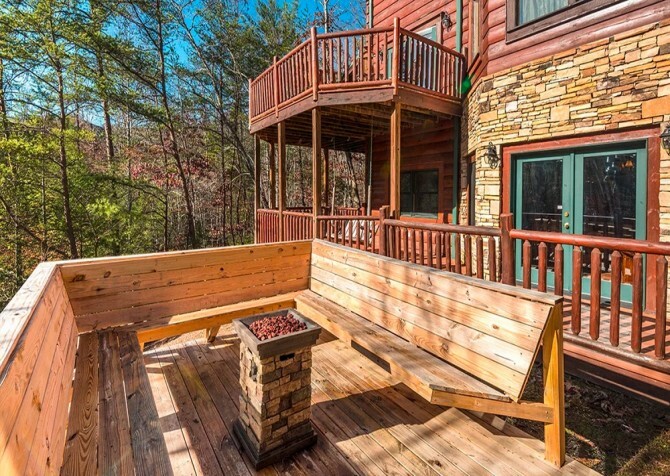 Ready to relax Smoky Mountain style? 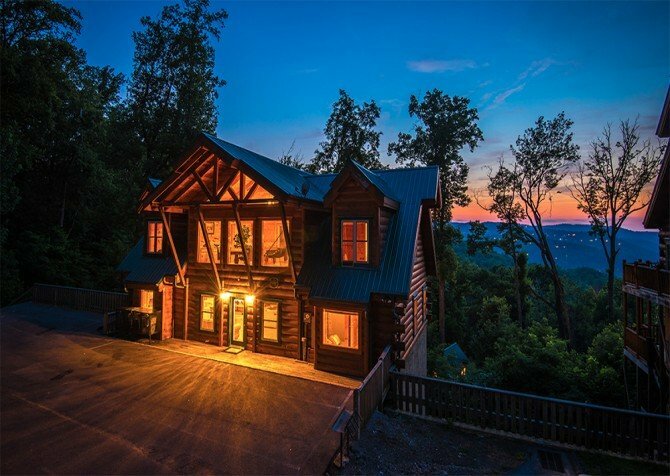 Book your Pigeon Forge chalet stay for 6 at Up the Creek, featuring tranquil wooded views with a sparkling river below, 3 cozy bedrooms, multiple outdoor spaces, a bubbly hot tub, 2 full bathrooms, a fully equipped kitchen, a big screen TV with DVD player, and a wood-burning fireplace (classic to the Smokies). Featuring 3 bedrooms, 3.5 bathrooms, 3 decks with beautiful views, and room for 12 guests, Hickory Splash Lodge in Sherwood Forest Resort offers a cozy place to stay in the Smokies with tons of amenities — including a private indoor pool, outdoor hot tub, home theater, arcade games and pool table in the rec room, fully equipped kitchen, and cozy king-size beds and bunks! Sleep up to 10 guests at Copper River, a gorgeous home on a 1-acre wooded lot with a luxurious private indoor pool, relaxing outdoor hot tub, fully equipped kitchen, 2 gas fireplaces, rec room in the loft, 3 full bathrooms, 2 half baths, and 3 bedrooms — each with a king-size bed, flatscreen TV, and access to an indoor jetted tub — making every night spa night! 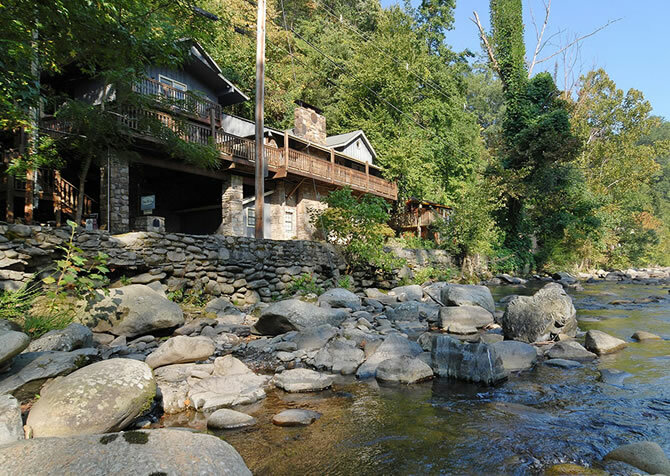 Mere steps from the Little Pigeon River, A River Song is a 3-bedroom, 4-bathroom, pet-friendly cabin for 10 in Gatlinburg. 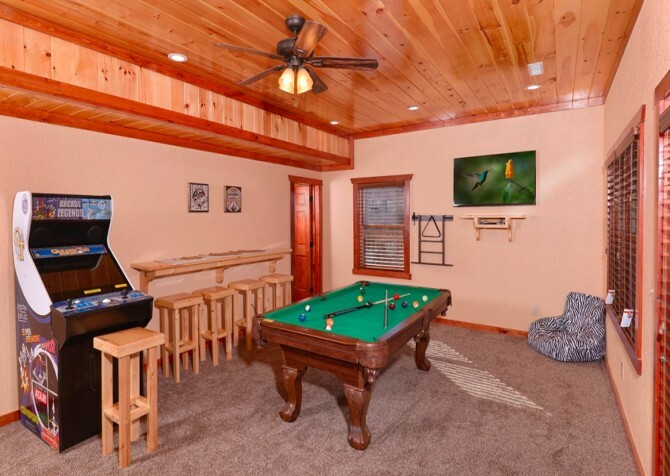 Kids will love the multiple game tables, while adults will appreciate the outdoor hot tub and flatscreen TVs. This charming riverfront property also boasts 3 gas fireplaces, a washer and dryer, fully equipped kitchen, free Wi-Fi, and so much more! Ideal for families and friends, Casa di Amore sleeps 12, offering 4 bedrooms with king-size beds, 4.5 bathrooms for convenience, a fully equipped kitchen for homemade meals, and tranquil outdoor spaces with wooded and seasonal mountain views. This pet-friendly cabin is also home to a booming rec room, with air hockey and pool tables, and a flatscreen TV. 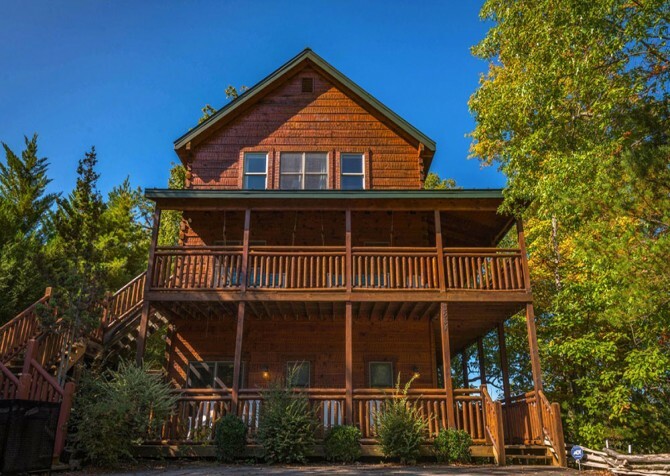 With 3 bedrooms, 3 bathrooms, and plenty of entertaining spaces for up to 8 guests, Queen’s Log Cabin presents a royal retreat in the Smokies for families and friends alike. Woodsy views keep your mind at ease while modern amenities keep the excitement rolling. 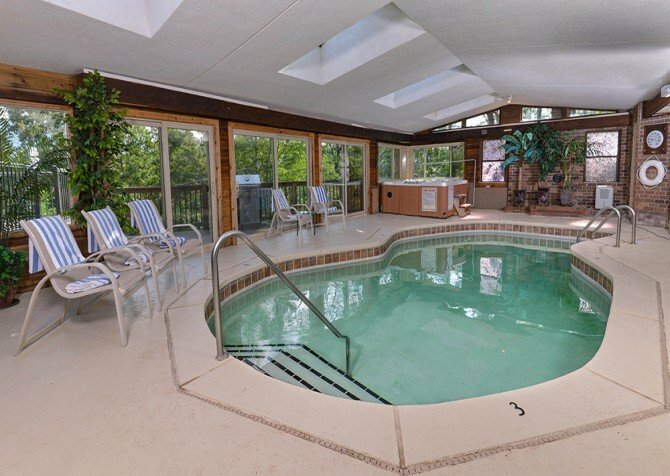 Enjoy evening hot tub soaks, nightly game battles in the rec room, and cozy nights by the fire. Pure Smoky Mountain charm meets modern cabin amenities — including a private indoor granite pool, Arctic Wind Air Hockey, 60-game Multicade, multiple big screen TVs, 5 electric fireplaces, an outdoor hot tub with TV, and king-size beds — at Splash ‘N Views, a new-construction cabin for 12 in the premier Gatlinburg Falls Hidden Valley Resort. 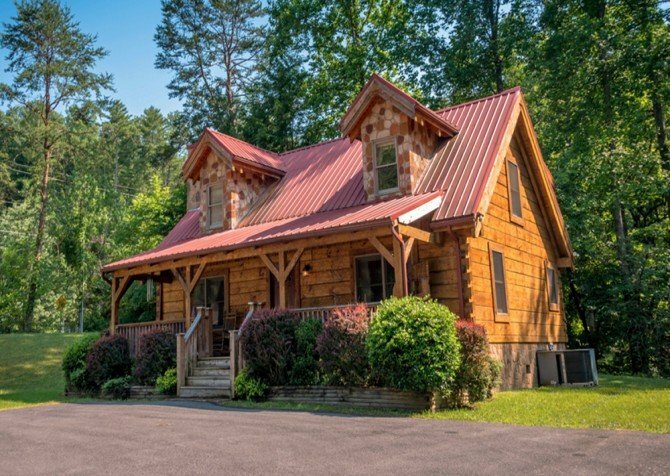 Retreat to A Li’l Bit of Heaven, a 2-bedroom +loft, 3-bathroom cabin for 10 in Pigeon Forge, TN. Its semi-private location is ideal for peaceful getaways, and the top-notch amenities are great for in-cabin fun. Enjoy a mug of coffee with tranquil mountain views, watch feature films on the big screen TVs, and shoot pool before bed. 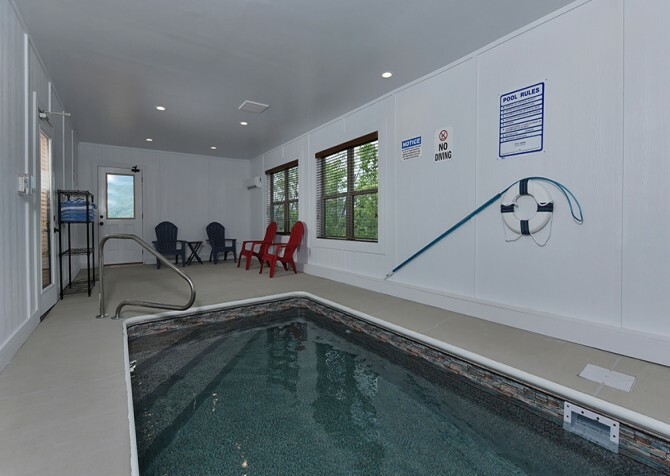 Community pool access, an indoor private pool for year-round swimming, an outdoor hot tub, a fully stocked game room for hours of fun, and a private movie theater in your cabin...need we say more? These are just some of the exciting amenities that come with LeConte Bear Plunge! 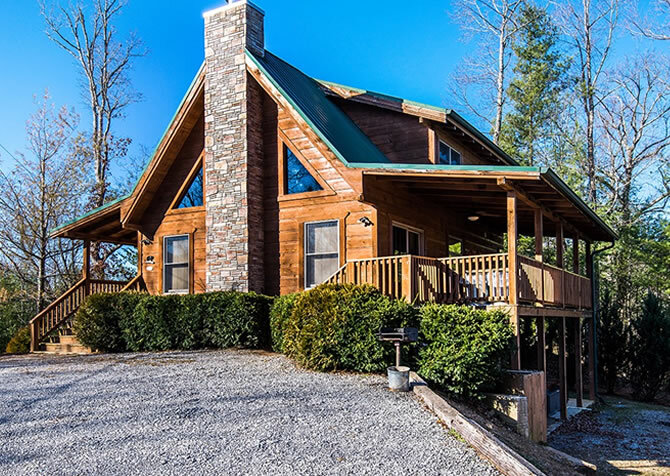 Best of all, this large group cabin, located less than 4 miles from the fun of Pigeon Forge, offers mountain views for miles! 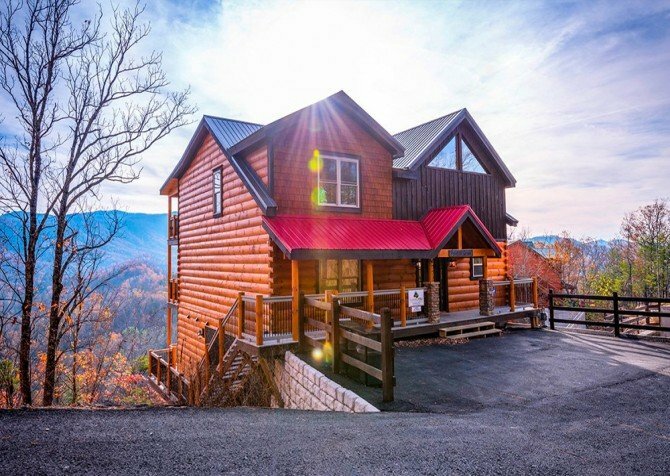 With 3 king bedrooms, 3 full bathrooms, a fully equipped kitchen, a rec room with game tables, tranquil tree-studded views, an outdoor hot tub, an indoor jetted tub, and a convenient location less than 5 miles to the heart of downtown Pigeon Forge, this pet-friendly cabin for 10 is perfect for family trips or getaways with friends. Featuring 5 bedrooms, 5 ½ bathrooms, and 3,000 square feet, Dream Catcher Spirit provides plenty of space and comfort for a group of up to 16 guests. Enjoy tree-studded views from multiple decks, fun games in the rec room, relaxing soaks in the hot tub, spa nights in the indoor jetted tub, and feature films on the big screen TVs. 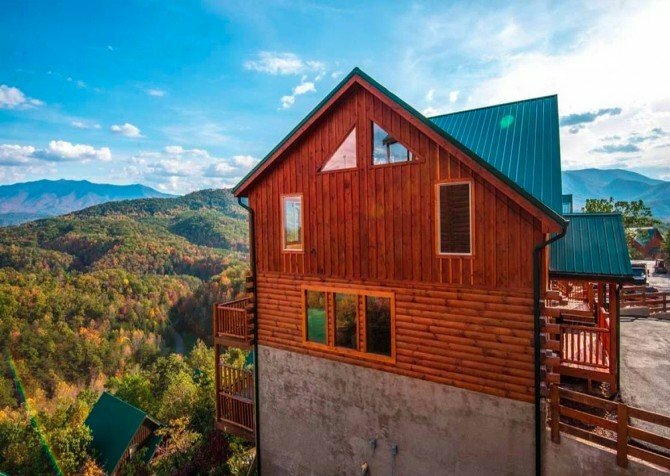 Breathtaking views rest in full view through the windows of this 3-bedroom, 3-bathroom cabin in Gatlinburg! 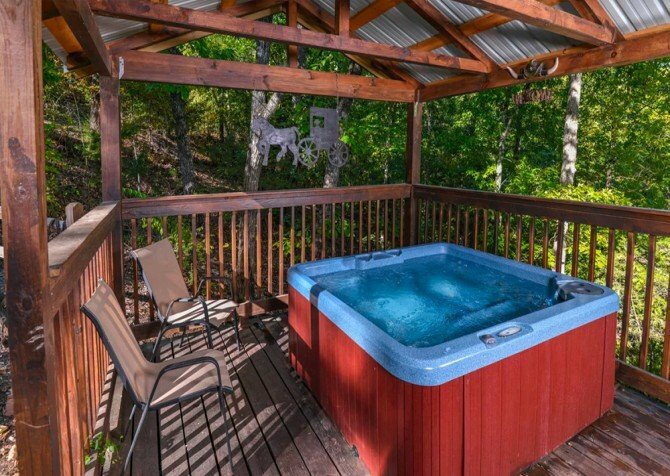 Relax in the hot tub or the indoor jetted tub for much-needed peaceful moments in mountains, shoot pool, and enjoy the conveniences of home near downtown! Spend quality time with friends and family in a peaceful mountain setting while still enjoying modern amenities such as a theater room, outdoor hot tub with incredible views, and game room complete with a pool table and large wet bar. Make day trips to nearby Pigeon Forge, under a 14-mile drive, for dinner shows, roller coasters, and shopping before coming home to a restful night’s sleep. 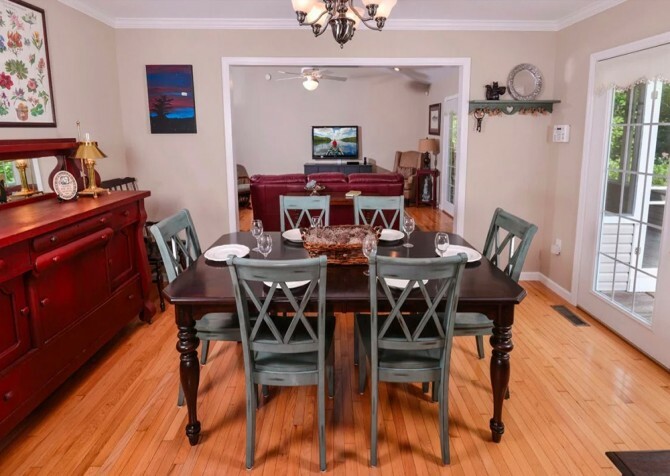 Harboring 3 bedrooms, 2 bathrooms, and a semi-private location, Holden On sleeps up to 8 guests and has all the conveniences of home, including Wi-Fi, a fully equipped kitchen, and a washer and dryer. 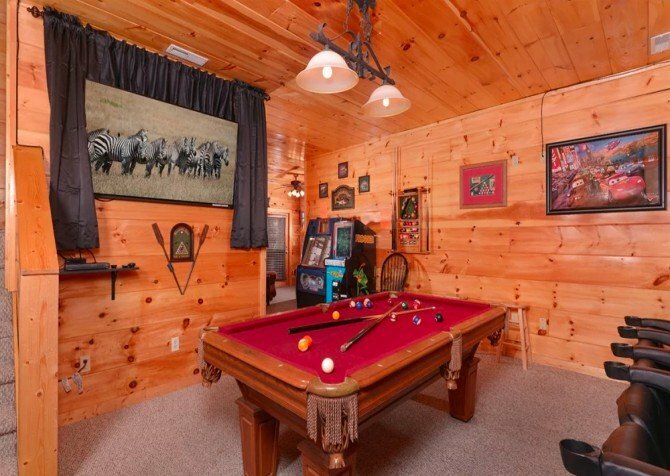 Plus, this charming cabin features great bonuses, such as a foosball table, outdoor hot tub, a flatscreen TV in every bedroom, and a gas fireplace. 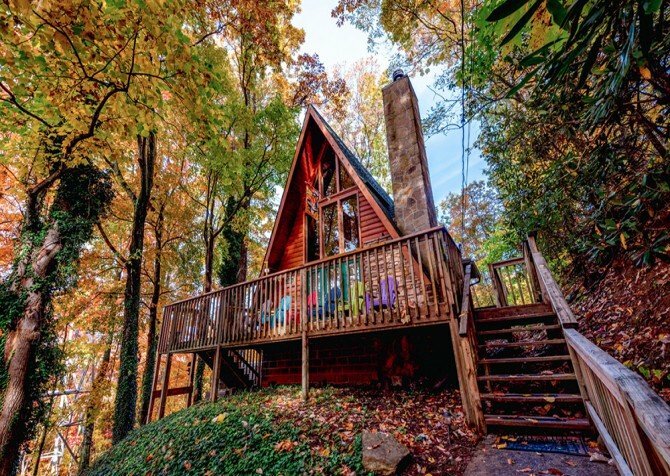 A lovely A-frame cabin less than 4 miles from downtown Gatlinburg, The Raven's Nest offers privacy, fun, convenience, and relaxation. With games and comfortable interiors, this 3-bedroom cabin is ideal for a vacation with friends or family. Stay cozy by the wood-burning fireplace while watching TV, enjoy a home-cooked meal at the spacious dining table, or have a friendly foosball tournament! 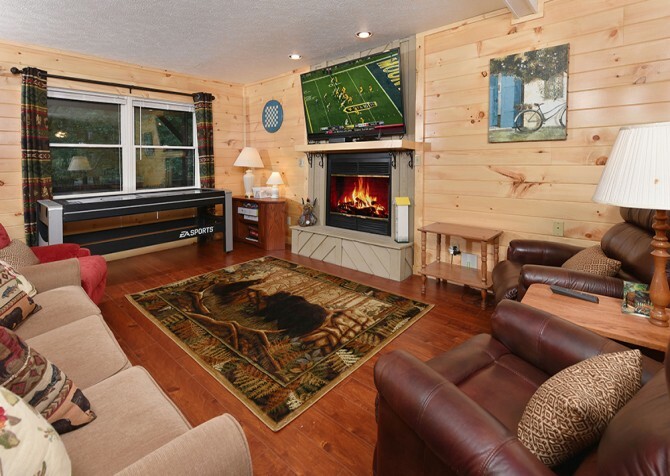 With room for 16, Keaton’s Kabin is a great choice for family vacations, special occasions with a few close friends, and small group gatherings in the Smokies. 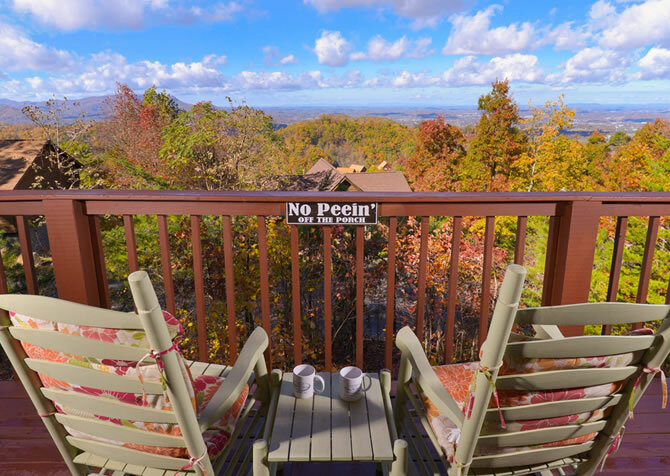 Less than 4 miles from downtown Pigeon Forge, this pet-friendly cabin has plenty of space, community pool access, and modern amenities when you're done exploring. Check it out in the Sherwood Forest for your next visit to the Smokies. At 4,200 square feet, The Appalachian is a large mountain lodge for 16, with 5 bedrooms, 5.5 bathrooms, a fully equipped kitchen, fun outdoor spaces, a private indoor pool, and more! 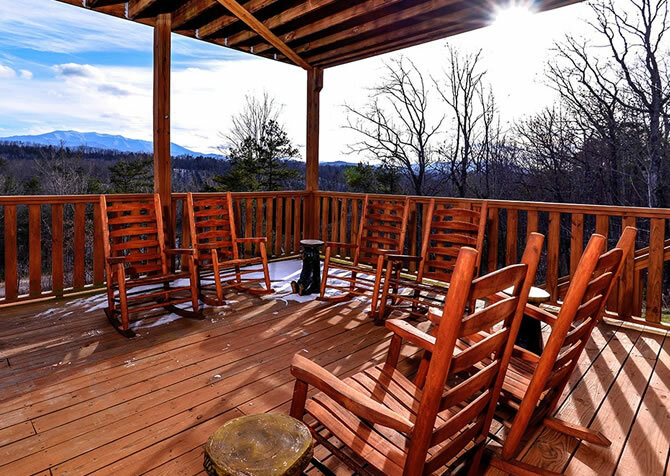 Unwind with stunning mountain views from the rocking chairs, soak in the bubbly hot tub, host movie nights on the big screen TV, and get cozy on winter eves by the fire. Small groups, couples, and families will love Beaver’s Treehouse in the Sherwood Forest resort. With community pool access, its own indoor pool, a private theater room, an outdoor hot tub, and so much more, this 4-bedroom cabin is perfect for groups that like to entertain. Enjoy room for 14 guests and an ideal location—only 5 miles from downtown—at this Pigeon Forge cabin. 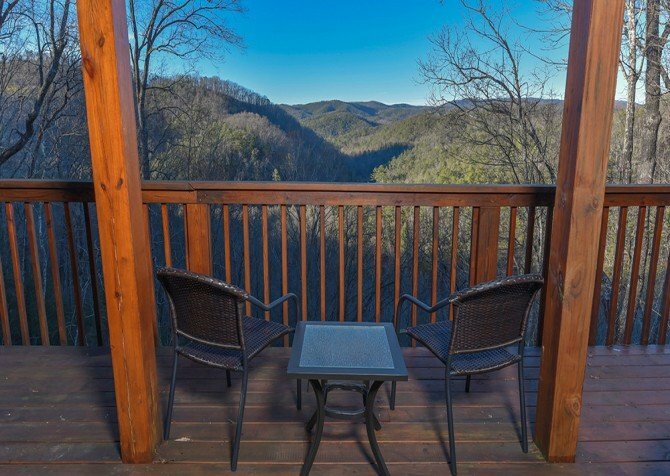 Set in the scenic hills of the Great Smoky Mountains, Black Bear Ridge Mountain Views features incredible mountain views. 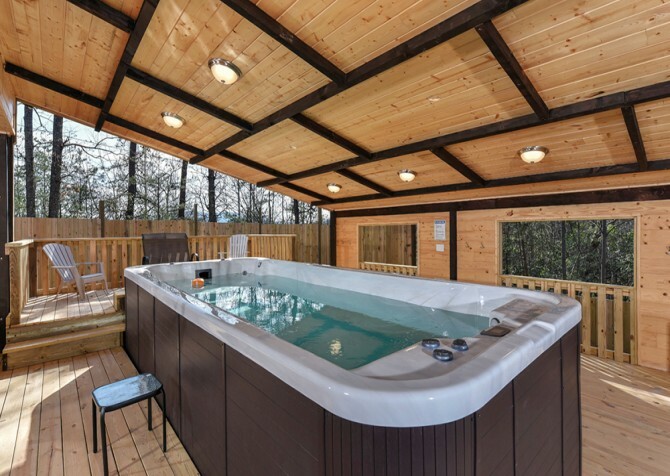 Unwind in the hot tub while watching TV, have a cup of coffee in the rocking chairs while getting some fresh air, play pool or air hockey, or curl up in the home theater with Blu-ray player for an awesome movie night in the cabin! At just over 3,300 square feet, Lookout Lodge is a great choice for group getaways. With 4 bedrooms, 6 bathrooms (4 with jetted tubs), and multiple decks, this cabin home provides comfort and entertainment for up to 22 guests. Enjoy mountain and tree-studded views all around, relaxing soaks in the hot tub, and cozy chats by a stacked stone fireplace. 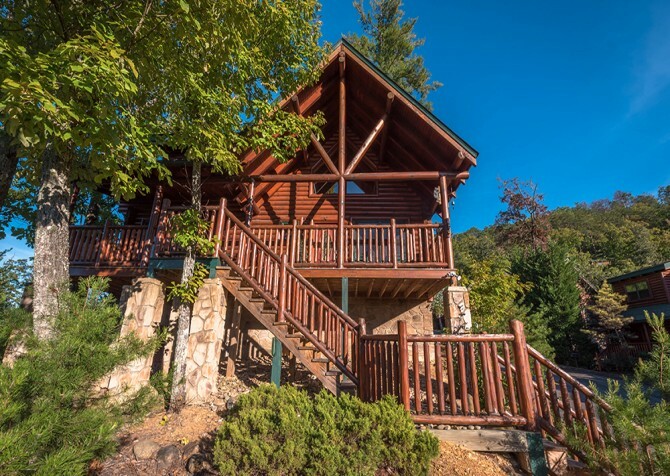 Featuring 5 bedrooms, 4 ½ bathrooms, 2 decks, and breathtaking mountain views, Smoky View with a Twist is a great cabin choice for family reunions or large-group getaways. With 3 king-size beds, a TV in every bedroom, a rec room with a pool table, an outdoor hot tub, and a big screen TV, keeping everyone entertained will be easy as pie. 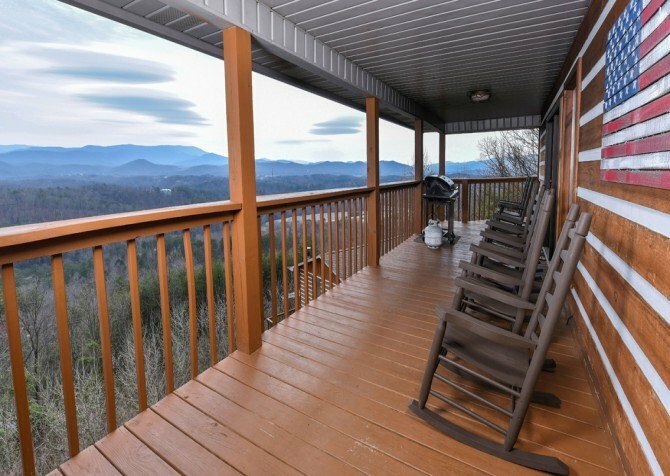 Look out for Smoky Mountain memories at Mountaintop Lookout, a 3-bedroom, 3-bathroom home, made to entertain up to 12 guests. Relax in the outdoor hot tub, play poker with pals, beat the high score on the arcade units, tuck the kids into the sleeping loft, unwind in the indoor jetted tub, and snuggle up with your spouse in the queen-size bed. If you've been looking for a getaway for your group, this beautiful 3-bedroom cabin may be the answer for you. This cabin features 2 living areas and 3 bedroom suites, 1 with a double-sided gas fireplace and indoor jetted tub. Lounge on your covered deck, take advantage of the beautiful kitchen, or play some air hockey or pool to while away the hours in Pigeon Forge. Sweet View Springs is ideal for family vacations and small group getaways. With plenty of bedrooms and bathrooms spread among 3,700 square feet of space, this cabin provides ample room for 14 guests and tons of entertaining options, including an outdoor hot tub, multiple game tables, big screen TVs, an outdoor hot tub, and a private indoor pool where you can swim year-round, no matter the weather. Perfect for multiple families or small groups of friends, Holiday Springs provides the privacy you’ve been craving from its 2-acre lot. You’ll soak up mountain views from your custom-built pool house, spacious living room, or screened-in porch with a gas fireplace. 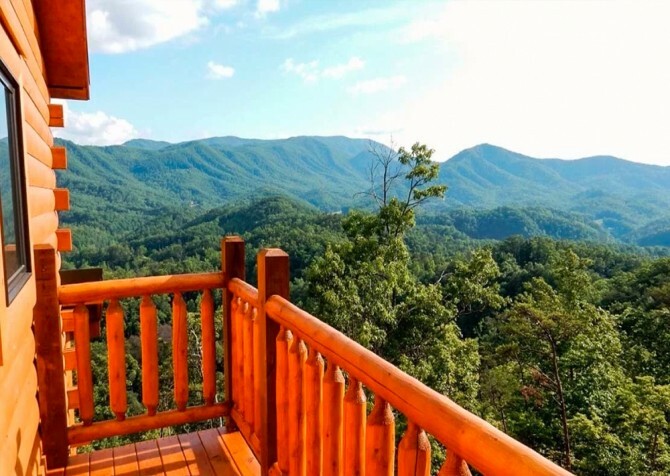 Enjoy the peaceful atmosphere of the Smokies along with tons of amenities at this cabin less than 10 miles from Gatlinburg. Sleeping up to 13 guests, Keaton’s Fishing Cabin is a 3-bedroom, 3-bathroom cabin in Pigeon Forge with homey conveniences and nice extras — perfect for family vacays or trips with friends. Soak in the bubbly hot tub, unwind in the rocking chairs, dine outdoors, enjoy entertainment on the big screen TVs, and rest comfortably on a mix of king and bunk beds. 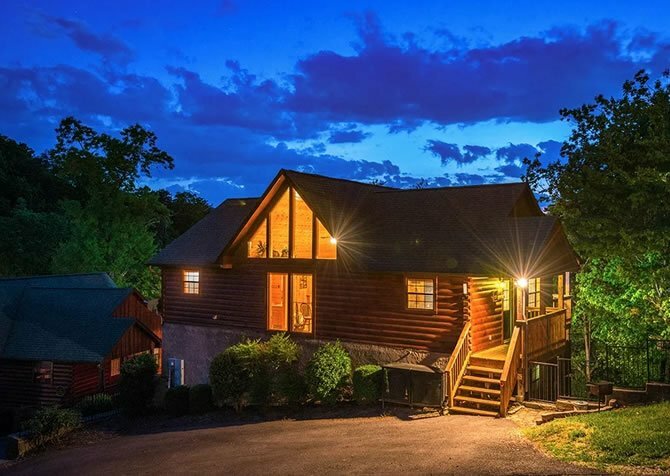 With 3 bedrooms, 2 full bathrooms, a fully equipped kitchen, and multiple deck spaces, Bear Hollow presents the perfect cabin escape for 6 in Pigeon Forge. Soak in the outdoor hot tub, play games on the Xbox 360, watch feature films on the flatscreen TV, chat with friends by the fire, and enjoy woodsy views from the rocking chairs and porch swings. 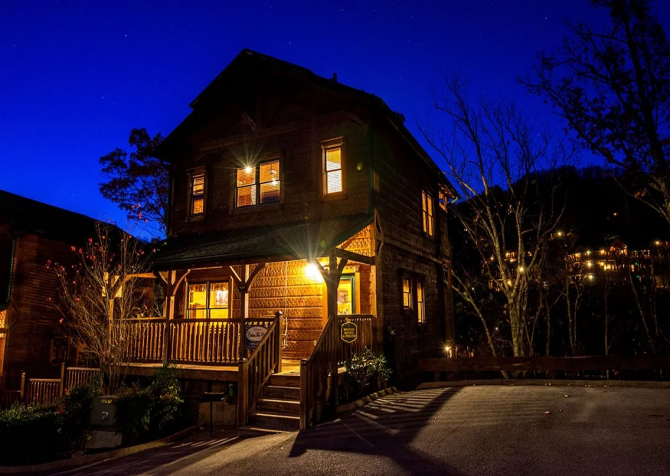 Nestled in the Chalet Village of Gatlinburg, this 3-bedroom +loft cabin rental sleeps up to 8 guests. Community pool access gives you a place to cool off in the summer months, while the hot tub offers a place for year-round relaxation. A semi-private location only a few miles from the Parkway makes it easy to explore the attractions, shops, and restaurants found in this bustling city. Slip away for a peaceful retreat at this creekside cabin tucked among the trees. Play games, relax in the hot tub, and whip up meals in the full kitchen before taking the short drive downtown for shopping, dining, and fun! 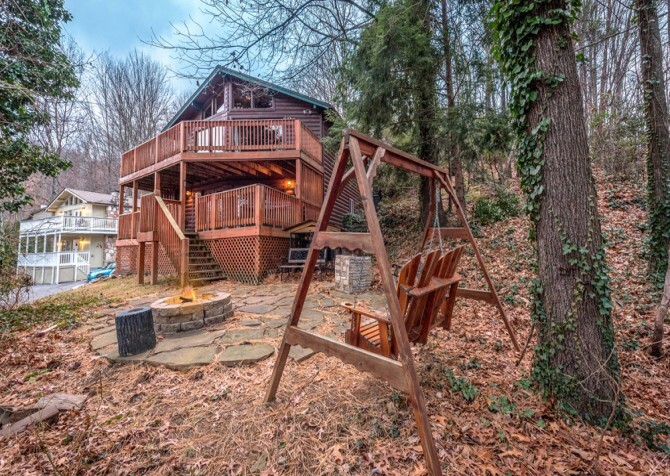 A true Smoky Mountain escape, this 3-bedroom cabin is located next to a gently babbling creek. A spacious yard and secluded location ensure that your vacation is as peaceful and relaxing as you imagined. 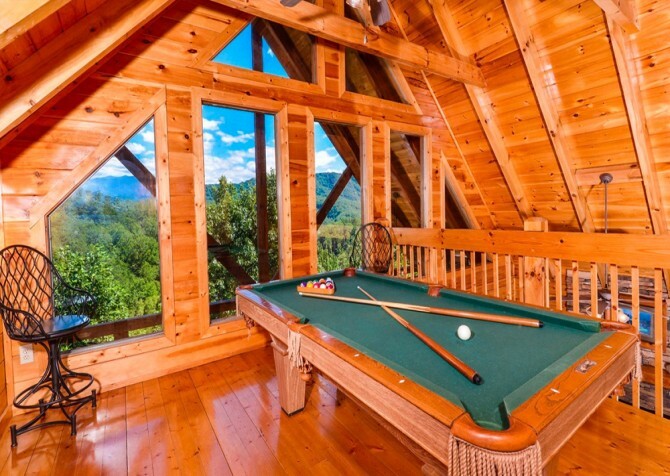 This Gatlinburg cabin offers a ping pong table and outdoor hot tub and is also just on the outskirts of the Great Smoky Mountains National Park, close to Hen Wallow Creek Falls. This luxurious all-log cabin rental boasts an impressive mountain view, large decks, and a secluded location that will delight you. 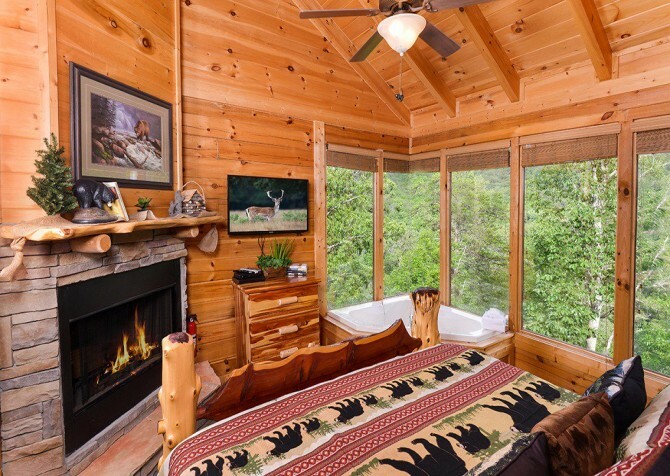 Four bedrooms and three bathrooms, this cabin features a master retreat with private balcony, walk-in closet, walk-in shower, and oversized log bed. Enjoy your fantastic view from the deck furniture or outdoor dining area before retreating to a quiet bedroom. 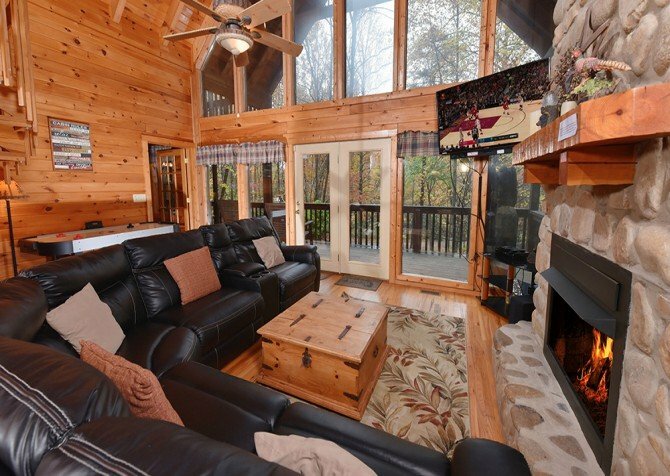 This 4-bedroom Pigeon Forge cabin is a smart choice for a family vacation to the Smokies. A fantastic view of the mountains is framed by a glass and beam wall in the living and kitchen area. The downtown area of Pigeon Forge is only a short drive away, and amenities such as the pool table, gas fireplace, washer/dryer, and gas grill can keep you entertained and comfortable. 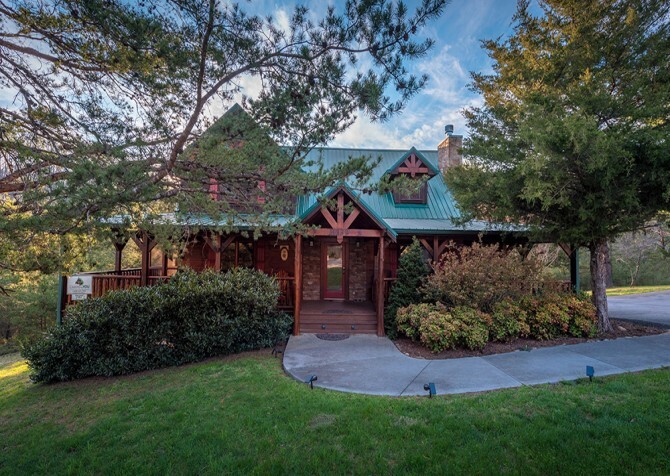 Featuring 4 king bedrooms, 4 full bathrooms, a fully equipped kitchen, multiple decks, and a spacious rec room with pool table, Majestic View is the perfect Gatlinburg cabin for your next family vacay, trip with friends, or couples’ retreat. Plus, this home offers stunning mountain views, a big screen TV, and a steamy outdoor hot tub. 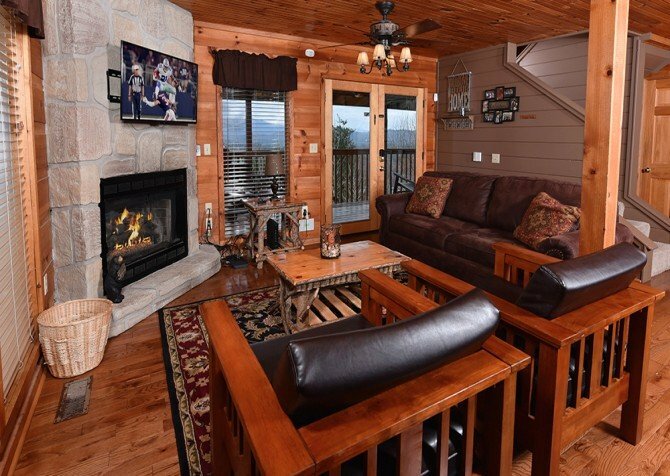 Get away for relaxation and fun to this 4-bedroom cabin in Gatlinburg. Along with being pet friendly, Bearfoot Lodge features tons of amenities, king-size beds, and a convenient location. It's just a few minutes from downtown and the Great Smoky Mountains National Park, but it offers plenty to do right at the cabin. 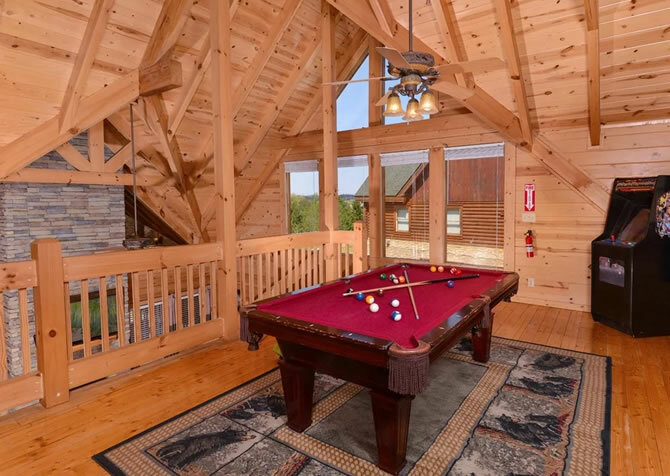 Harboring tranquil tree-studded views, a steamy hot tub on the screened-in deck, and a game room with a pool, air hockey, and a big screen TV, keep your group of 8 entertained with ease at Elk Crossing. 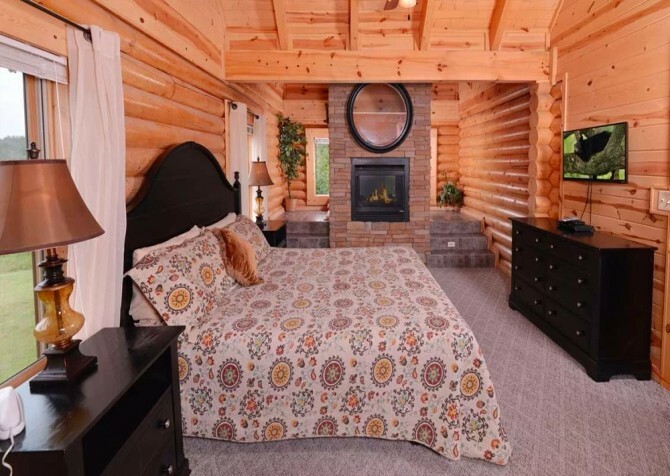 This 3-bedroom, 3-bathroom cabin in Pigeon Forge also offers community pool access through Woodridge Village Resort, free Wi-Fi, a gas grill, a stacked-stone fireplace, and 3 king-size beds. 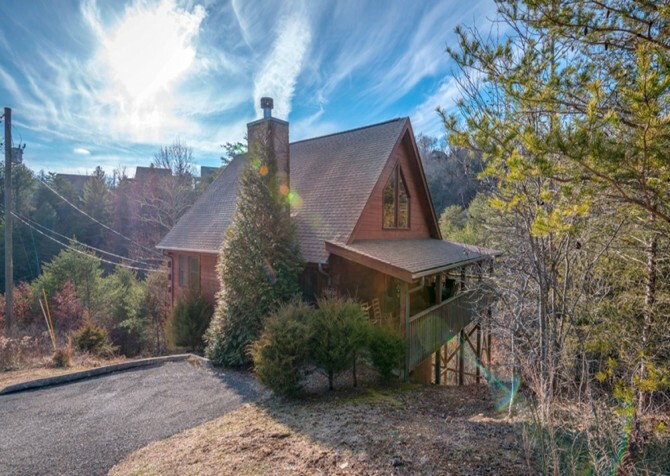 Located in the mountains just above Gatlinburg, this 3-bedroom, 3 ½-bathroom cabin is only 4 miles from the downtown Parkway. Oversized showers will delight your group, while amenities such as a washer/dryer, big screen TV, internet access, and gas grill make this cabin a comfortable retreat. 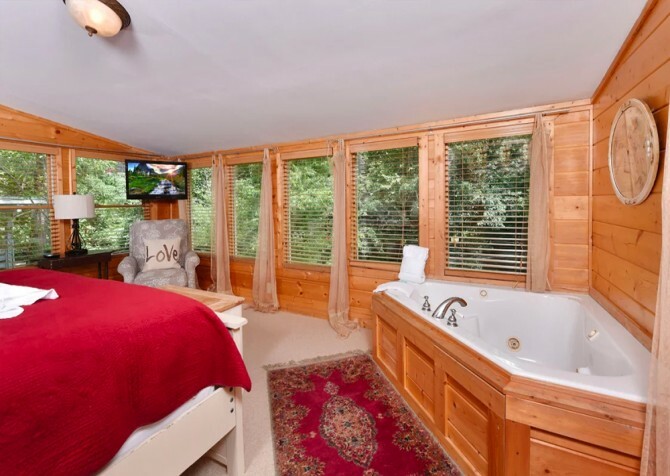 Watch movies from the bed every evening or hit the hot tub for an enjoyable night in your cabin rental. If you’re looking for a small group cabin with a little something for everyone, try Splash 'N Around. 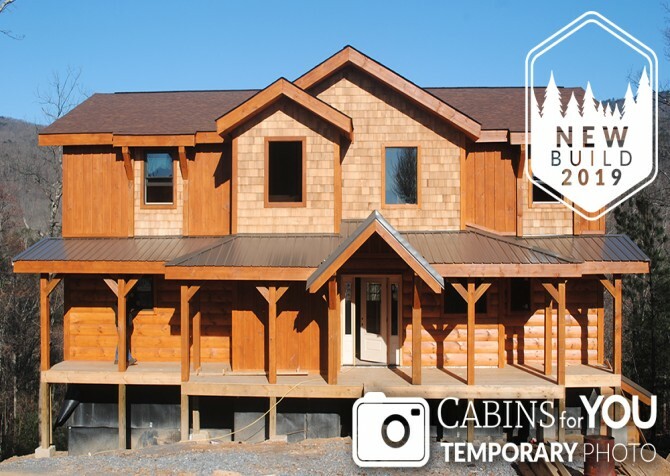 This 10-person cabin with 3 bedrooms and 5 bathrooms features a media room with a pool table and flatscreen TV, a covered porch with amazing mountain views, an outdoor hot tub, and a private indoor pool! Best of all, you’ll be only minutes from the fun of downtown. 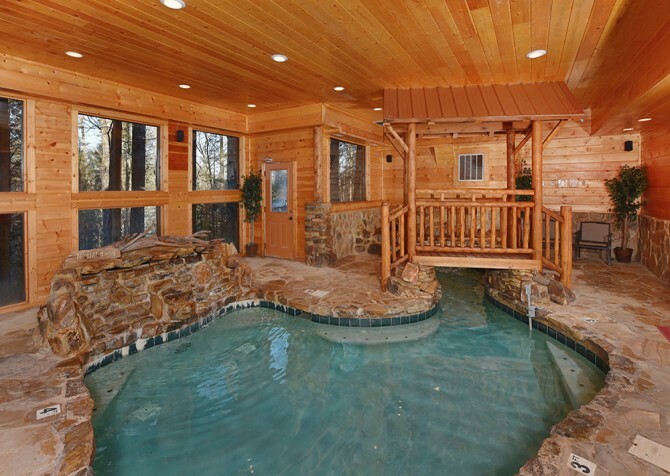 Enjoy taking a swim any time of year in this 5-bedroom cabin that offers its own private indoor pool. A gorgeous log interior, wood floors, a grand stone fireplace, and even an antler chandelier offer a classic cabin feel. Sierra Springs also offers a semi-private location and a home theater that will delight everyone on your Pigeon Forge vacation. 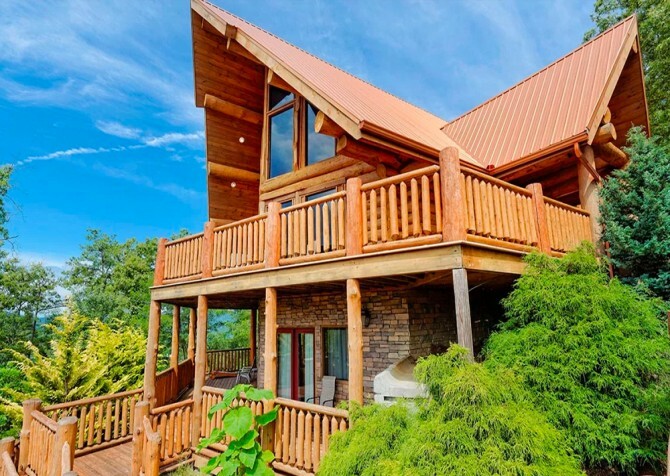 With 4 bedrooms and 3 bathrooms, this Pigeon Forge cabin boasts awe-inspiring views of the sweeping Smoky Mountains. There's a view to enjoy from nearly every room here, in addition to a large kitchen and master bedroom with fireplace and jetted tub. Enjoy playing on the foosball table or accessing the wireless internet before soaking in your outdoor hot tub or spending an evening on the rocking chairs. 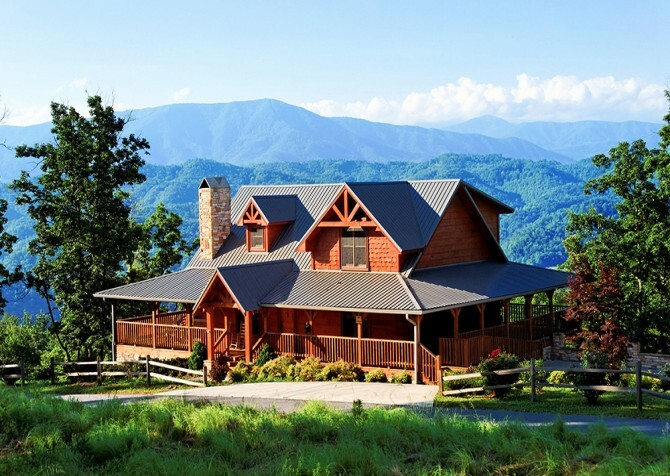 This beautiful 5-bedroom, 4-bathroom cabin in Pigeon Forge can sleep up to 16 guests. 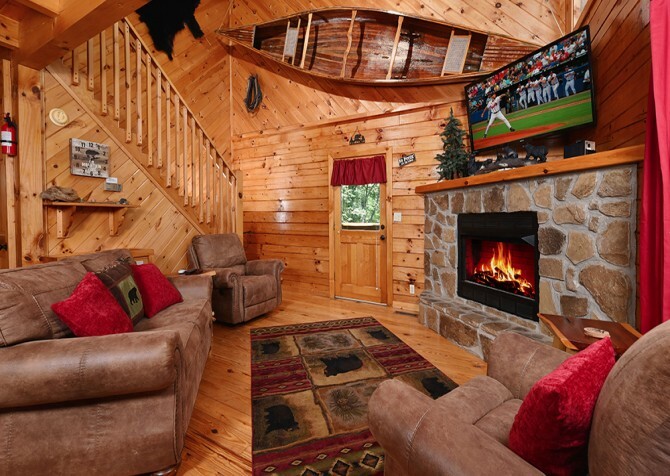 Papa Bear Lodge is a 3-story cabin fully equipped with amenities the entire group will love! After a fun evening downtown, come back and enjoy a relaxing dip in the hot tub, game time in the rec room, and movie night on the 65-inch flatscreen TV! A peaceful escape in the Mountain Shadows Resort, Mountain View Lodge features 3 bedrooms, 3 bathrooms, and room for 8 guests. Stay entertained with flatscreen TVs, a card table, or just relax in the outdoor hot tub, indoor jetted tub, and living room. 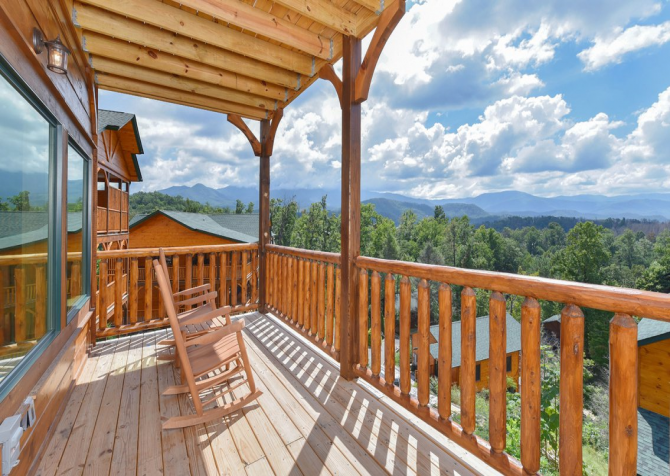 Enjoy mountain and wooded views from the deck or make homemade meals in the kitchen with stainless steel appliances. Groups of up to 14 people will love the comfortable interior, long list of fun amenities, and modern style of Mountain Time. 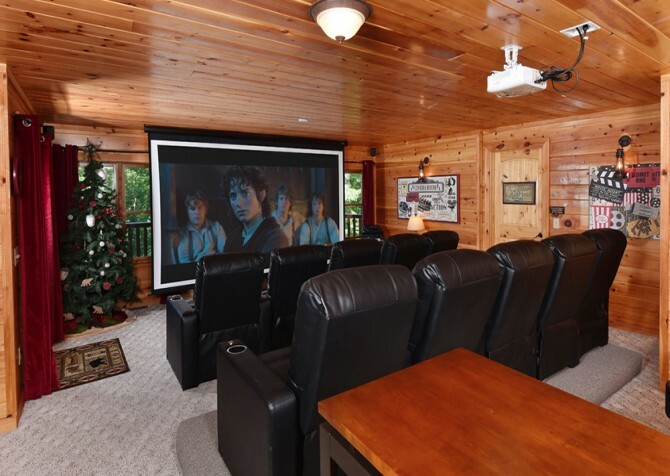 Located less than 3 miles from downtown Pigeon Forge, this 5-bedroom cabin features a an awesome theater room, a fully loaded rec room, a full kitchen, and more. Keep this cabin in mind for your next retreat or other small group get-together. Just under 10 miles from the heart of Pigeon Forge, Hillsong Heaven boasts the perfect combination of fun and functionality in the Smokies. 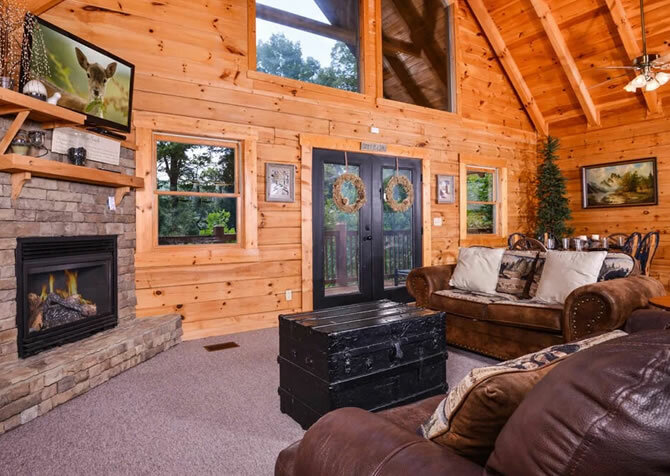 The loft, (which doubles as a game room and theater room) along with the luxurious living spaces and large rocking-chair porch make this cabin a great fit for your next group getaway to Pigeon Forge. 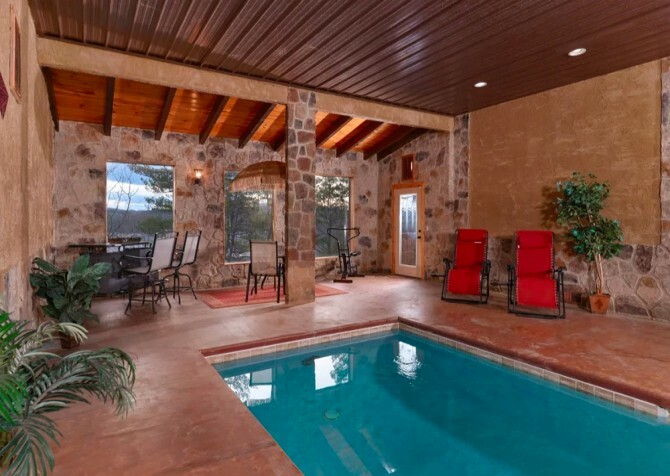 Enjoy pool access, mountain and wooded views, and more! 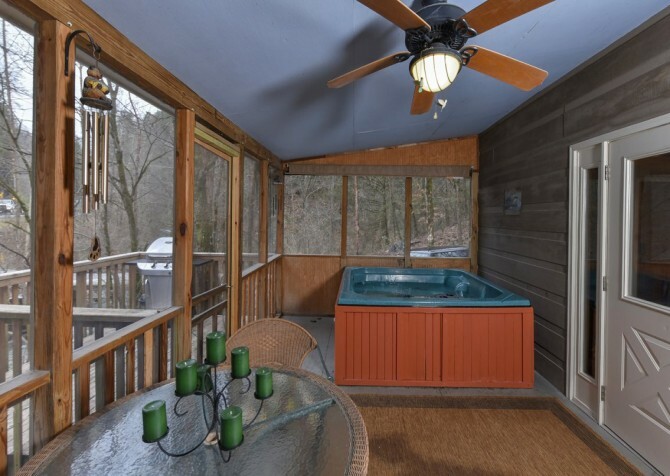 Along with 2 bedrooms (plus a loft) and 3 bathrooms, this Pigeon Forge cabin rental offers its own private indoor pool for year-round swimming! 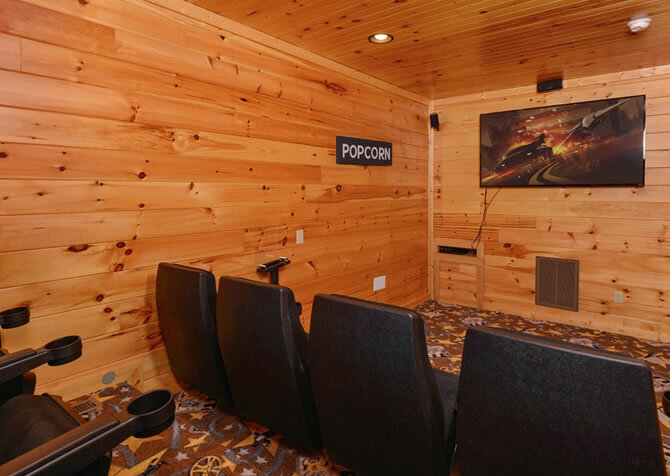 Stocked with amenities galore, this cabin also boasts a private home theater room for your enjoyment. 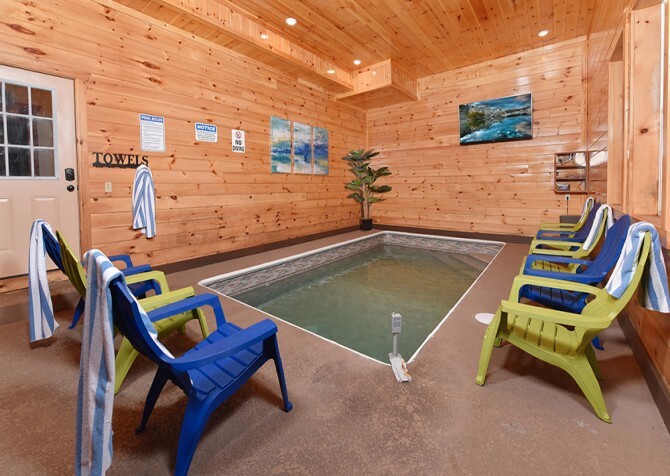 Take a dip in the hot tub, access the internet, play on the shuffleboard table, or just relax on your vacation to the Great Smoky Mountains. 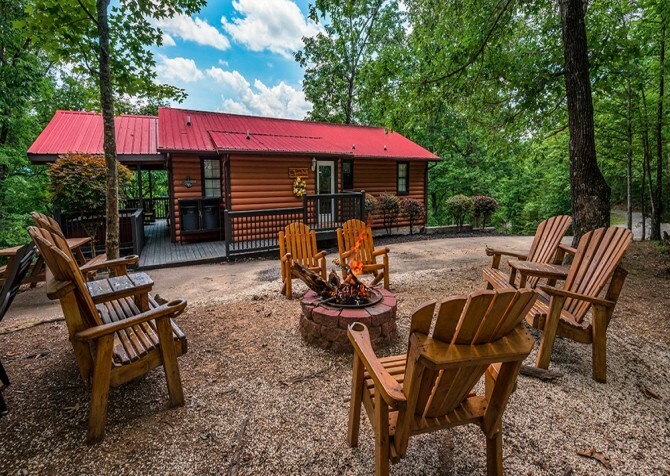 Only 4 miles from Pigeon Forge, Savannah Splash makes it easy to enjoy group attractions on the Parkway, but this small group cabin also offers tons of entertaining amenities right inside the front door. Plan movie night in your home theater; take a relaxing soak in your outdoor hot tub; or splash around in your private indoor pool. Find 3 bedrooms, 2 bathrooms, space for 10 guests, a fully equipped kitchen, a rec loft with games, and much more at Bearly Normal! 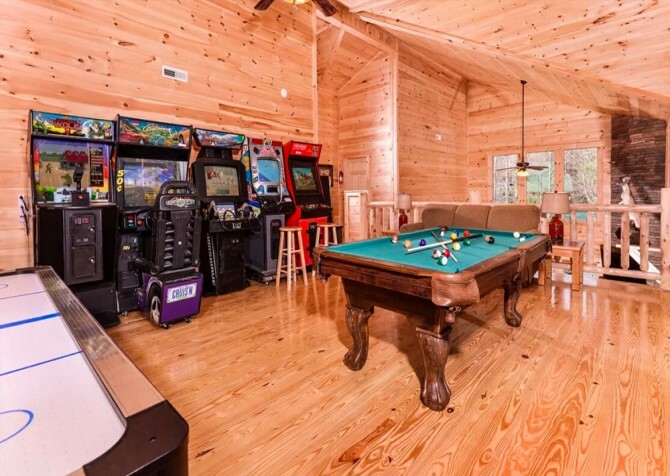 Play arcade games and foosball, whip up homemade meals, splash at the community outdoor pool, soak in the bubbly hot tub, watch DVDs on the flatscreen TV, and snooze in the master suite’s king-size bed. Escape from it all with family and friends when you vacation to this 3-bedroom cabin that sleeps 10 guests. Multiple decks provide space for enjoying the great outdoors, while the nearby swing set is great for the little ones. 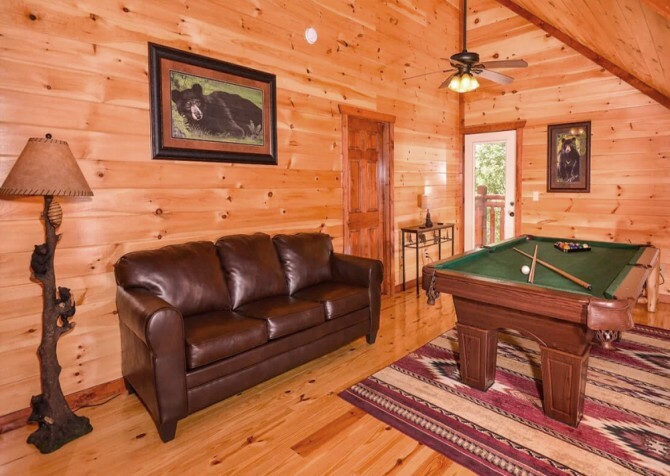 Log furnishings, a spacious kitchen, pool table, and hot tub make this cabin a great home away from home in Pigeon Forge. Within Bear Creek Crossing Resort, you’ll find a 3-bedroom, 4-bathroom stunner filled with games, big screen TVs, king-size beds, and a private indoor pool! 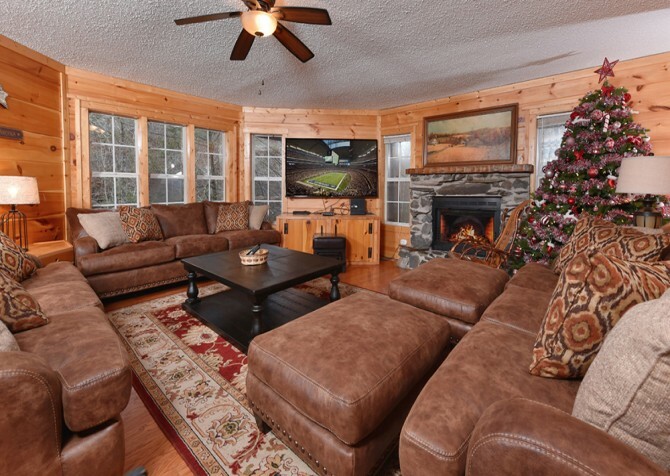 Hilltop Plunge is perfect for a party of 12 looking for a memorable time in Pigeon Forge, TN. 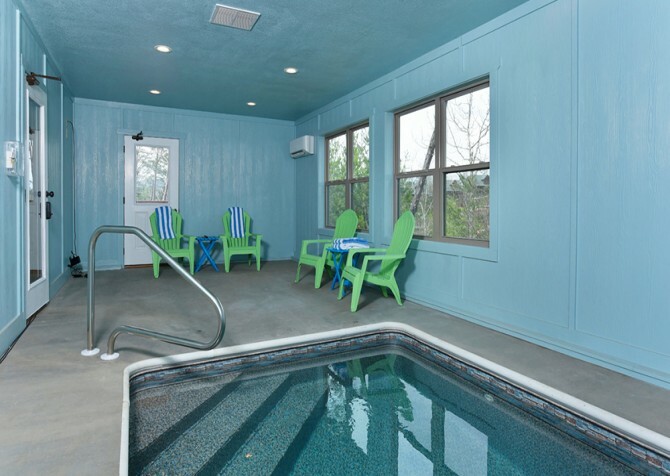 Hop in the hot tub for soothing soaks, whip up meals in the fully equipped kitchen, and splash around day or night! Plan a family vacation or a small group getaway to Patches Cabin in the Summit View Resort. 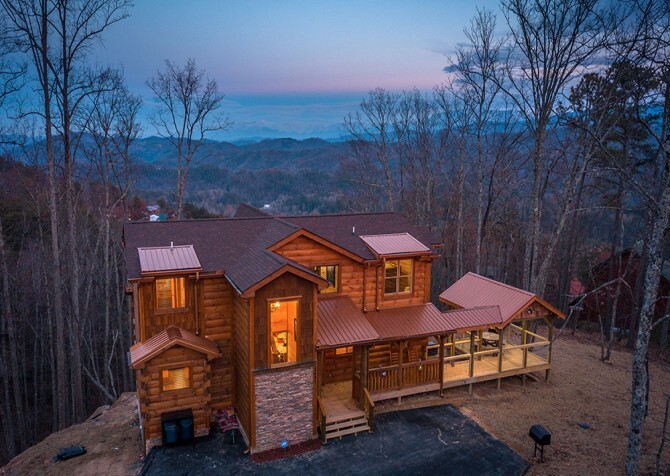 Featuring stunning mountain views and only a 6-mile drive to Pigeon Forge, this 10-person cabin offers 4 bedrooms, 3 bathrooms, and more than 2,000 square feet of space. 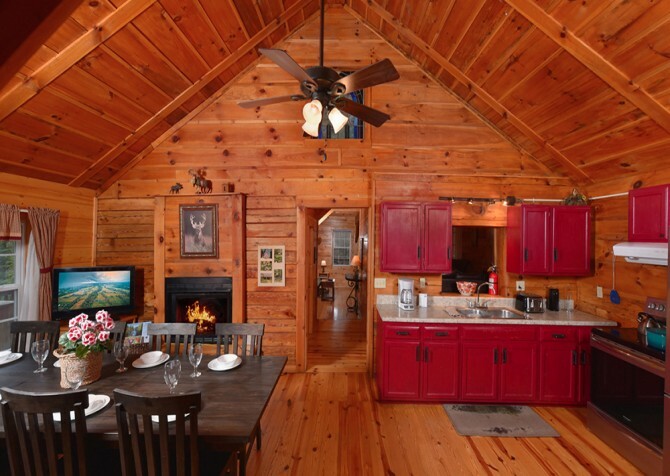 With luxury in every detail, Deer Leap is a beautiful 4-bedroom cabin with room for 16 guests. It offers gorgeous views and a long list of amenities. Relax on the 4 levels of decks, unwind in the hot tub, kick back in front of the fireplace, whip up group meals in the gorgeous kitchen, or watch TV in the privacy of your own room. 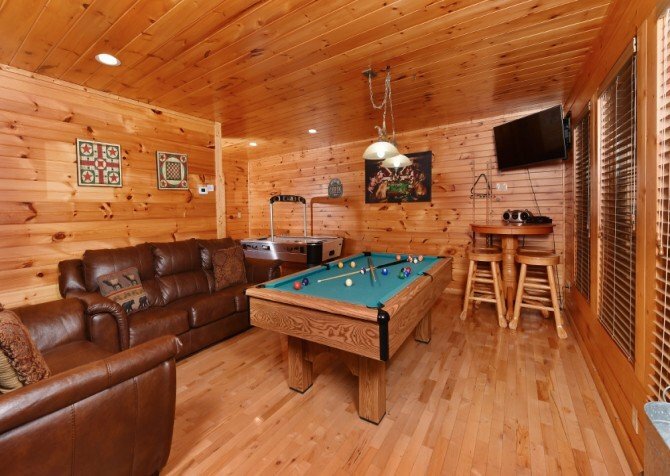 The cabin also boasts a pool table, foosball table, air hockey table, and poker table! 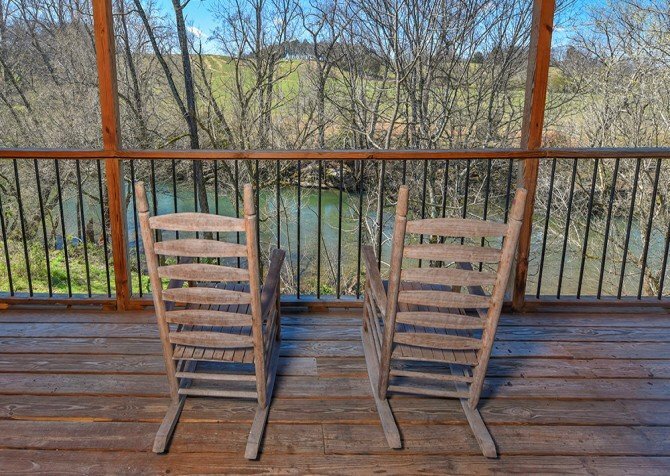 Sleeping up to 8 of your friends or family members, this charming 2-bedroom +loft, 2-bathroom cabin is right next to the calmly flowing waters of Little Pigeon River. Enjoy the view from your spacious deck or climb into the large swim spa for a relaxing soak. 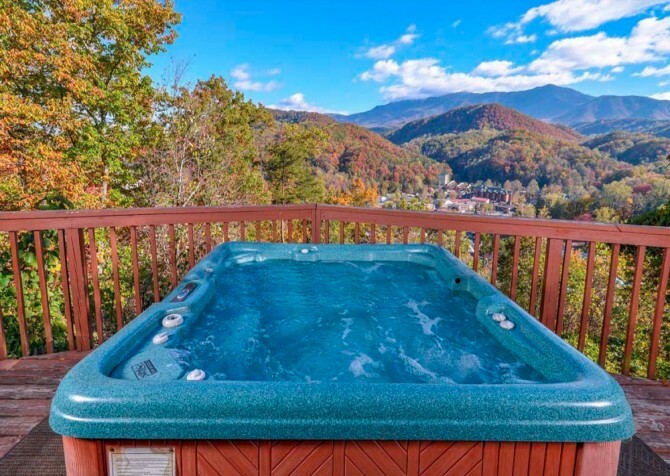 Walk to downtown Gatlinburg, relax in the indoor jetted tub, or access the wireless internet during your downtime in the Great Smoky Mountains. 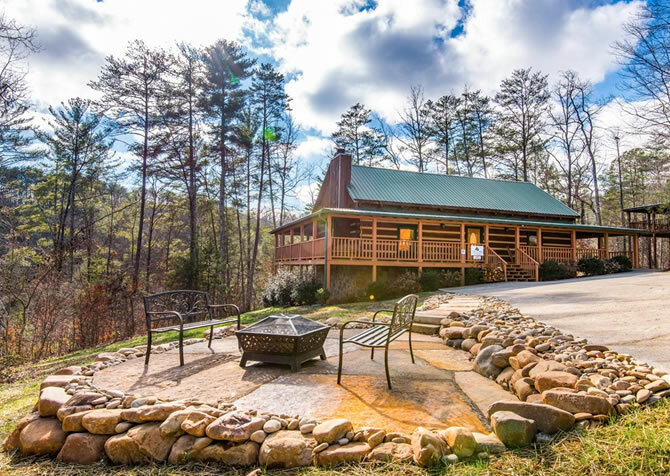 At 2,000 square feet, Eagle’s Nest is a spacious Smoky Mountain cabin for 8, featuring 3 king bedrooms with TVs, a fully equipped kitchen, and an open-concept living area with games. 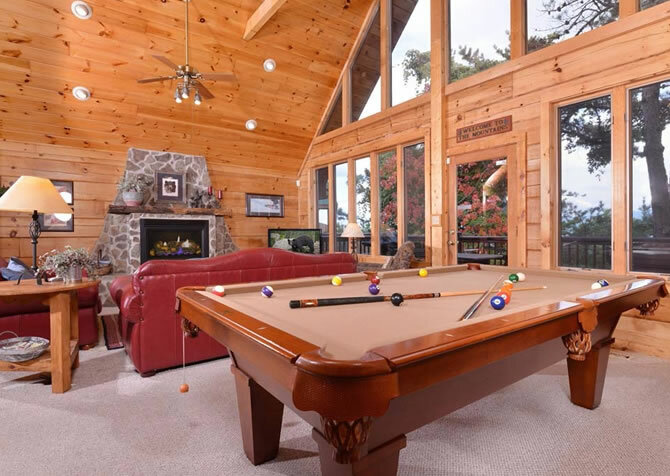 Play pool with friends, watch DVDs on the flatscreen TV, sip cocoa by the stone fireplace, soak in the bubbly hot tub under the stars, and watch the clouds roll over the mountains each day. At 3,500 square feet, Keaton’s Streams and Dreams boasts room for up to 14 guests with a mix of king and queen beds and a twin bunk. This 4-bedroom, 3-bathroom cabin by the river offers a fully equipped kitchen, free Wi-Fi, and plenty of seating outdoors. Multiple big screen TVs, an outdoor hot tub, an indoor jetted tub, plus board games will keep everyone entertained and relaxed. 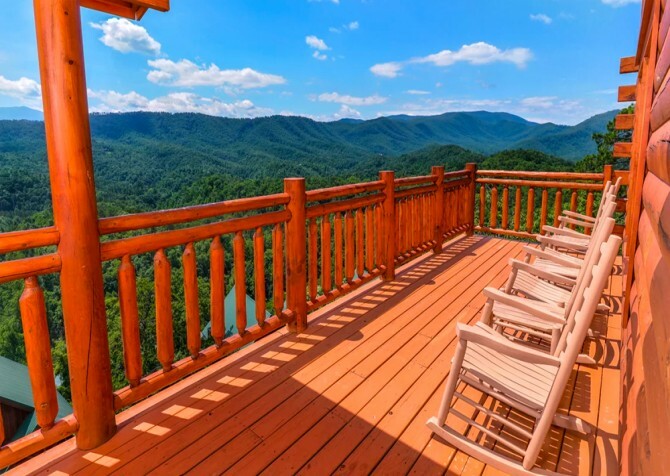 About 8 miles from downtown Pigeon Forge, Mother’s Dream is a great choice for guests who want to stay close to the action without sacrificing the view. This small group cabin offers 3 bedrooms, 3 ½ bathrooms, and sleeping space for 12. Enjoy plenty of space and tons of relaxing amenities inside Mother’s Dream! 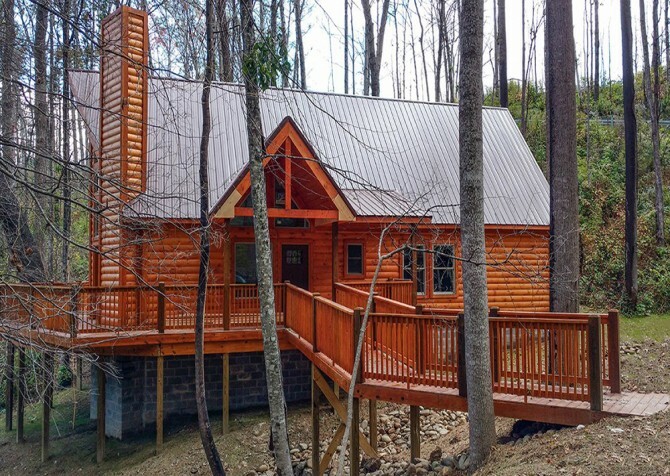 In Keaton’s Bear Cove Creek Retreat, you’ll find a 3-bedroom, 3.5-bathroom cabin for 10, great for a couples’ getaway, trip with friends, or a family vacation. 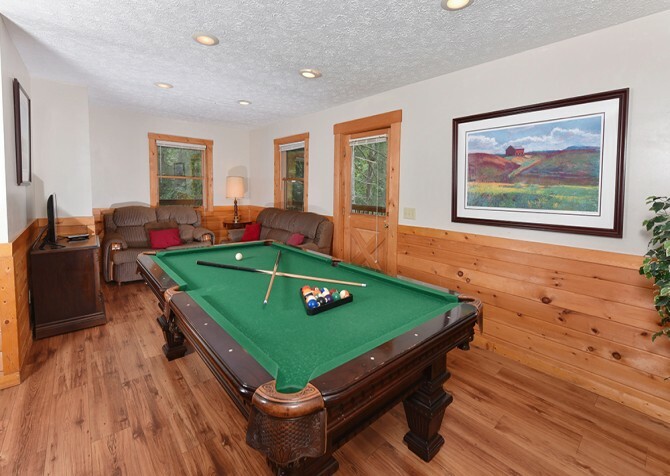 Play pool all night, sip coffee on your private deck, soak in the hot tub under the stars, enjoy tranquil wooded views, whip up feasts in the fully equipped kitchen, and snooze in the 4 king-size beds! 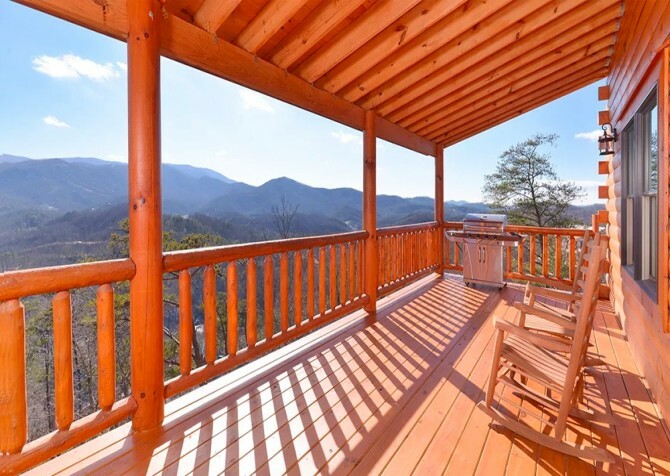 Moondance is a 2-bedroom plus loft, 3 1/2-bathroom pet-friendly cabin perched high atop the mountains in Pigeon Forge. 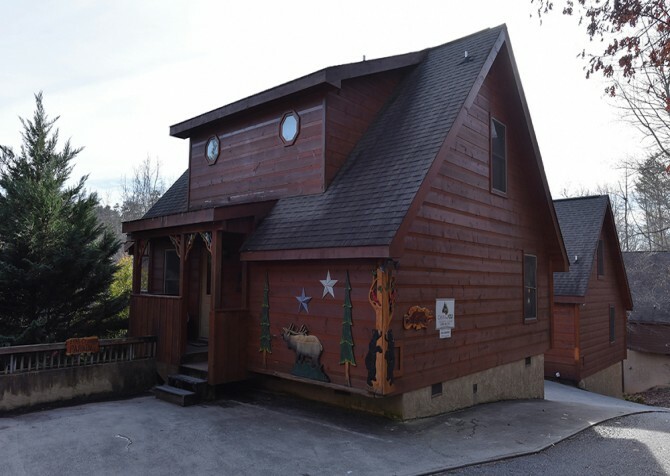 Along with gorgeous mountain views, the cabin offers an outdoor hot tub, rocking chairs, a cozy living room, a spacious rec room with pool table and foosball table, a big screen TV and DVD player, and a bunk room the kids will love. Featuring Smoky Mountain views, 3 bathrooms, 2 bedrooms, and a master suite in the loft, Eagle View is a newly refurbished home in Sky Harbor Resort, perfect for a crew of 13 guests. Play in the rec room in the afternoon, enjoy an evening soak in the hot tub, and host movie night on the 4K 65-inch ultra HDTV!